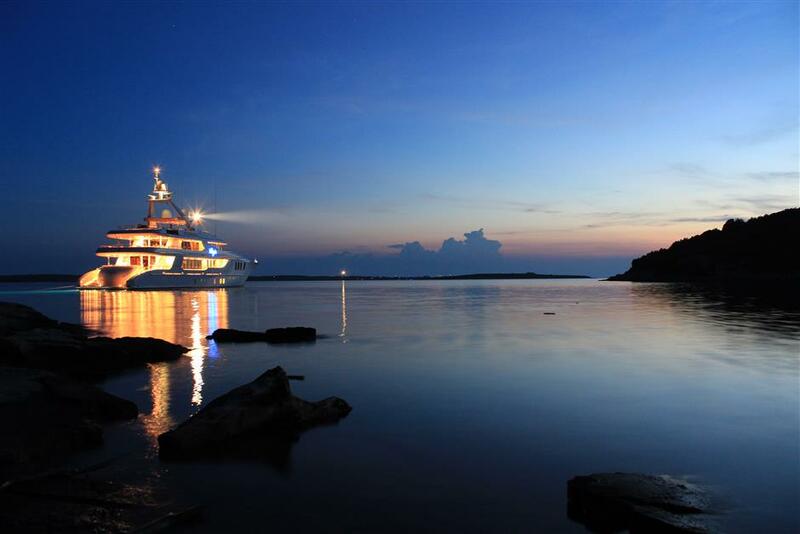 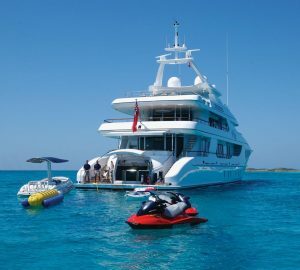 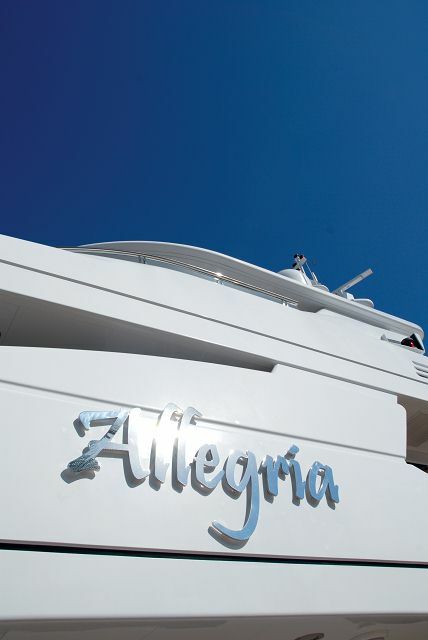 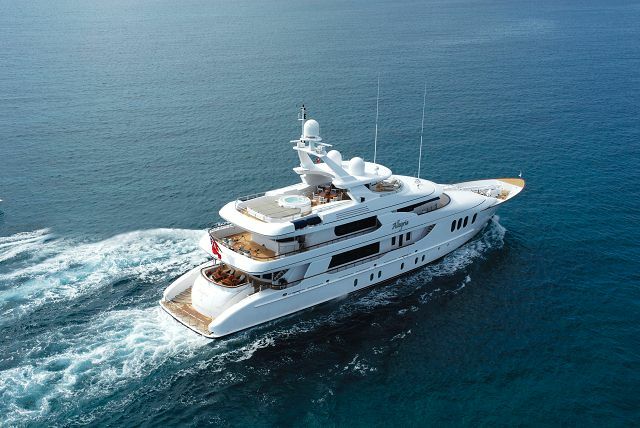 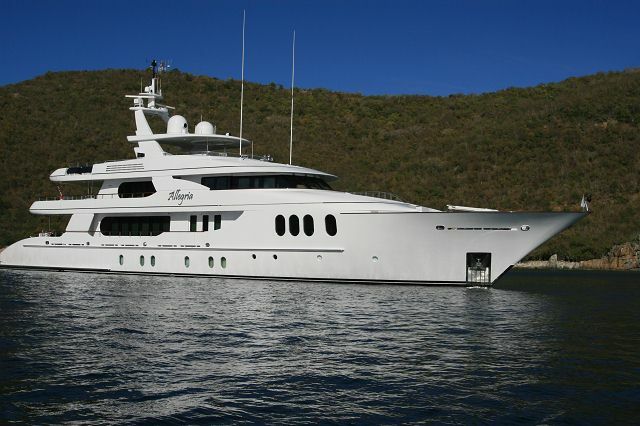 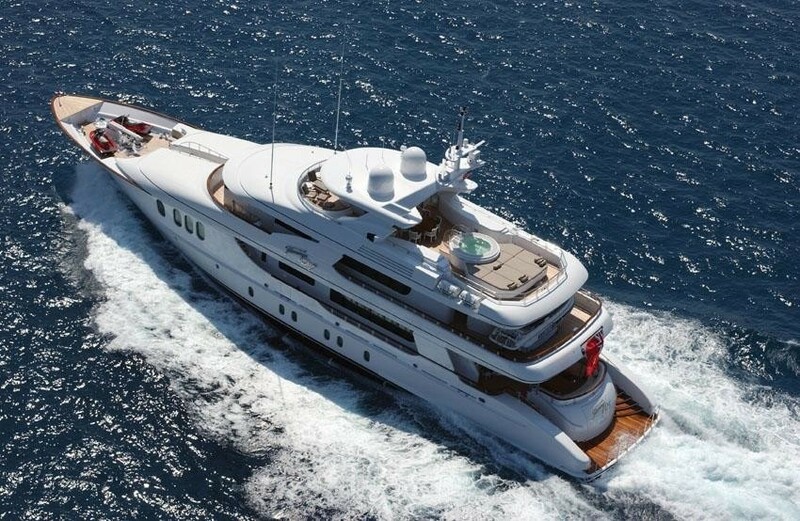 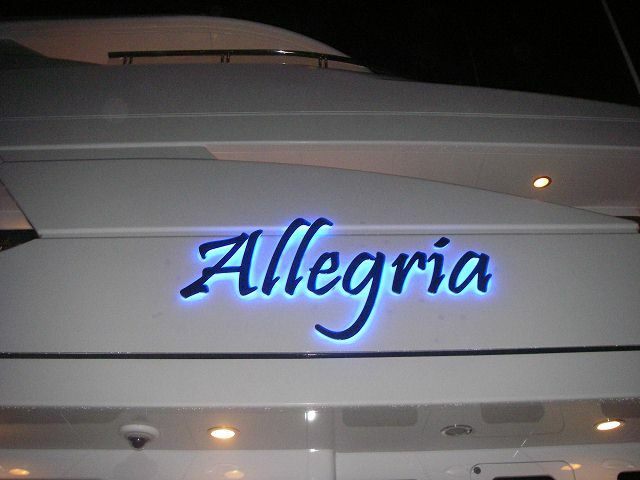 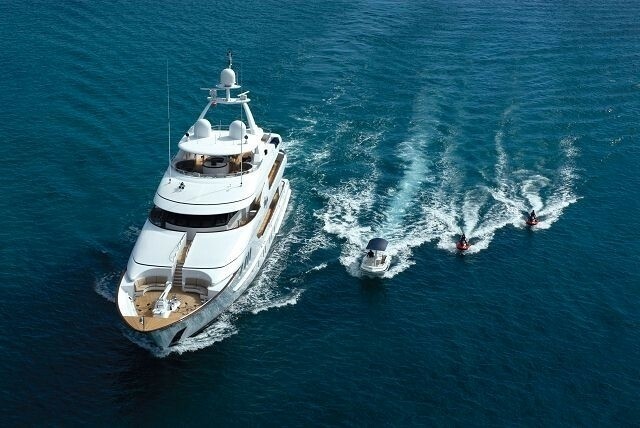 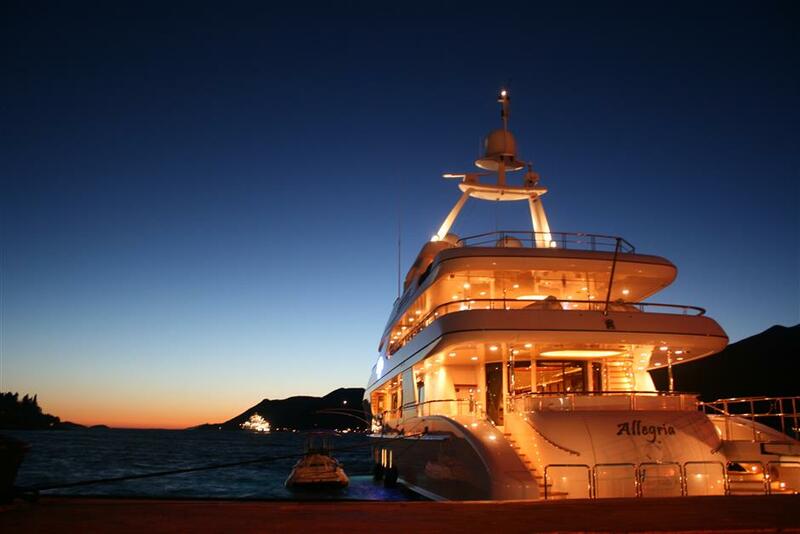 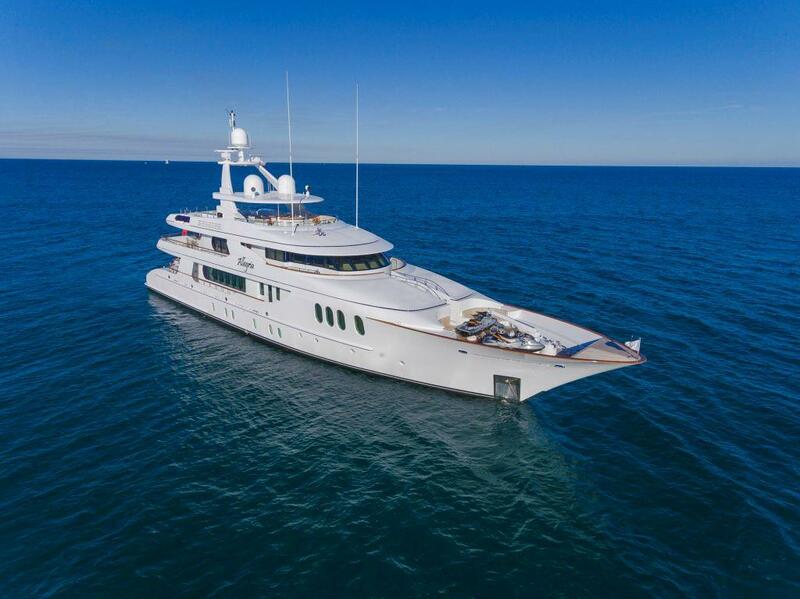 Built-in 2004 by Hakvoort of the Netherlands and refitted in 2019, luxury motor yacht AMICA MEA (ALLEGRIA, Flamingo Daze) measures 46.33m (152ft) and can accommodate up to 11 charter guests. 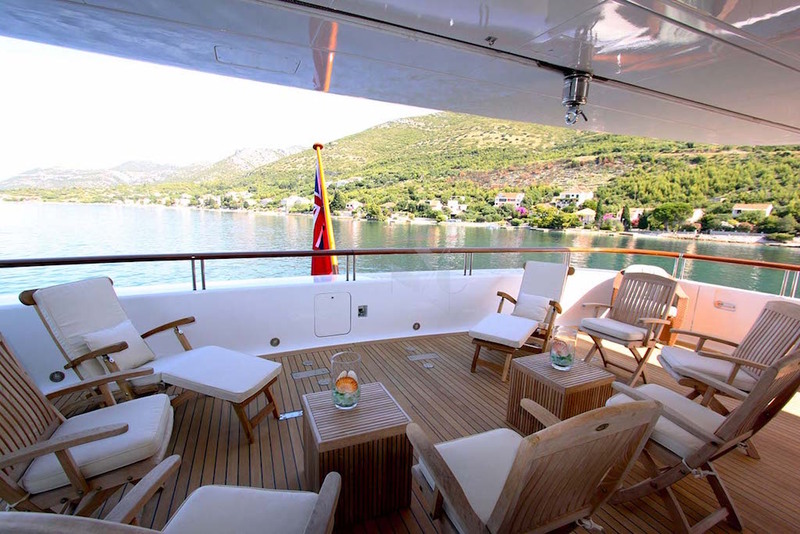 In 2016 the yacht received an extensive refit, she boasts a contemporary, timeless interior décor and exceptional exterior living space. 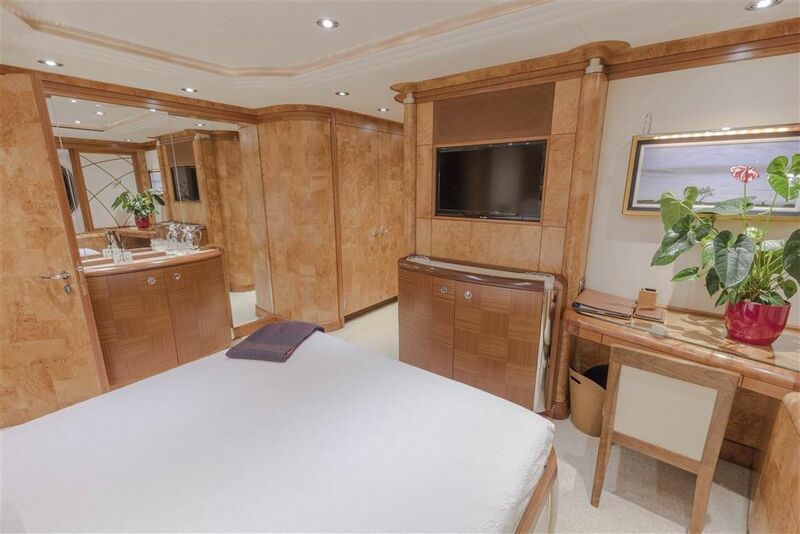 The interior design is the work of Glade Johnson and features cherry and maple burl woods, fine marbles and stylish neutral soft furnishings. 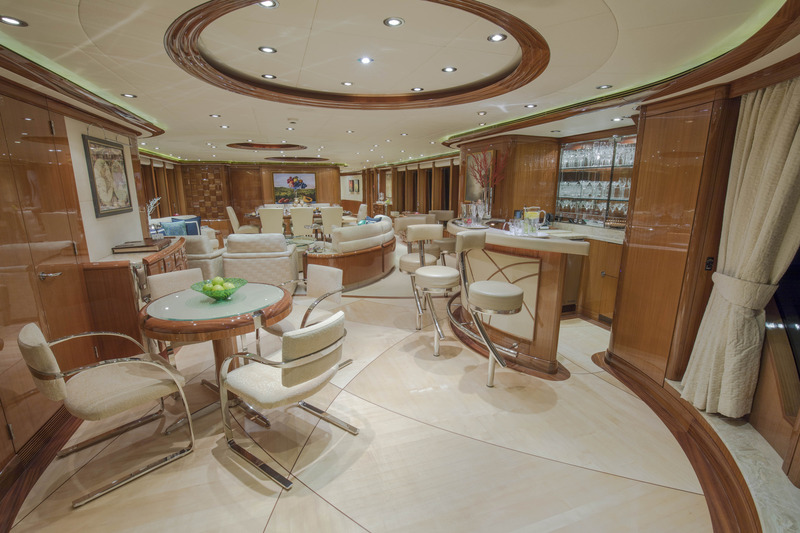 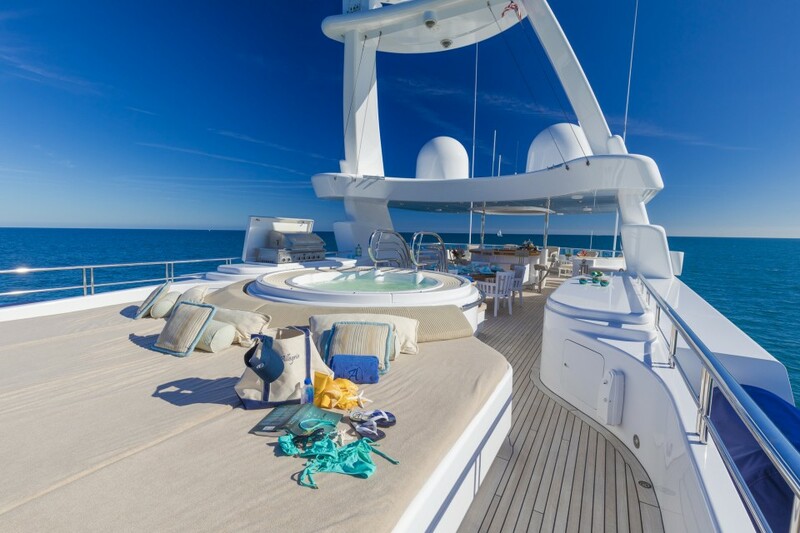 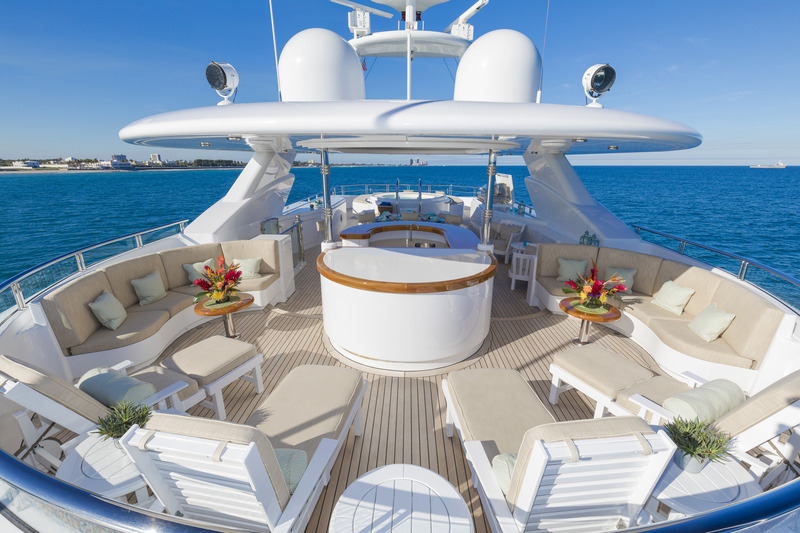 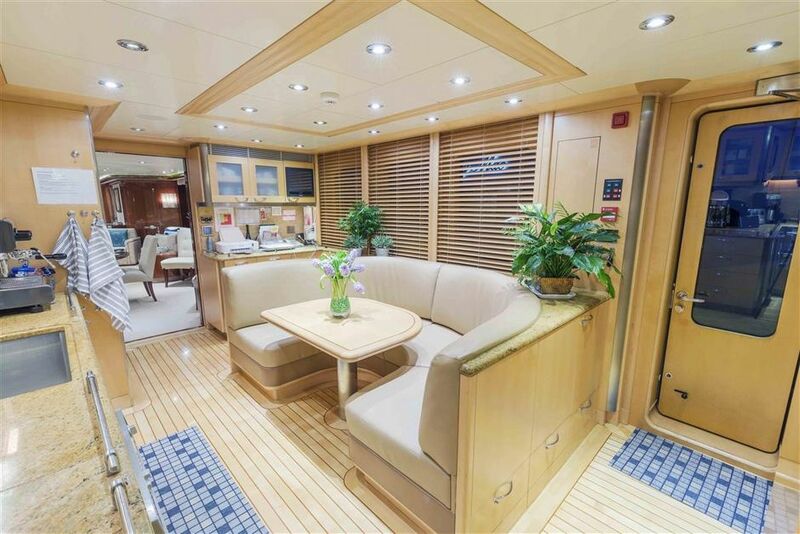 On the main deck, a generous salon and dining are set in an open plan, offering the social lounge, complete with wet bar and stool seating aft and formal dining forward. A foyer leads to the fully equipped country galley to port, while to starboard is a day head, followed by a private entrance to the full beam master stateroom. 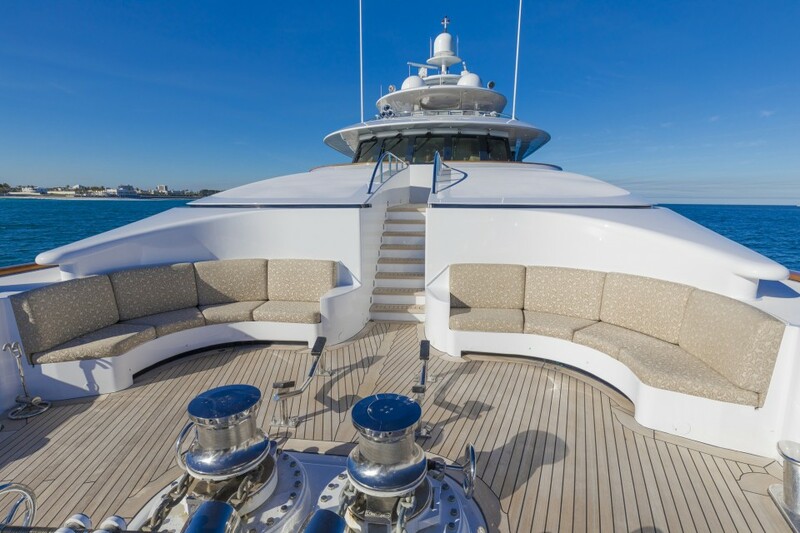 On the upper deck is a sky lounge and TV entertainment area, offering a drop-down 112’’ screen, surround sound, ample plush seating, and additional wet bar. 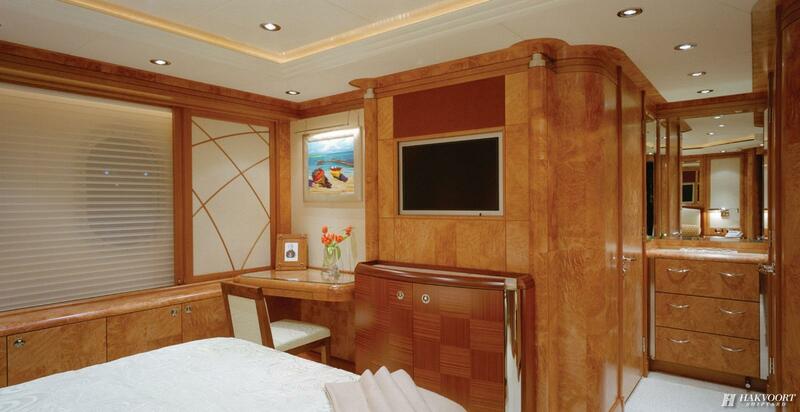 Accommodation is in 5 ensuite guest cabins. 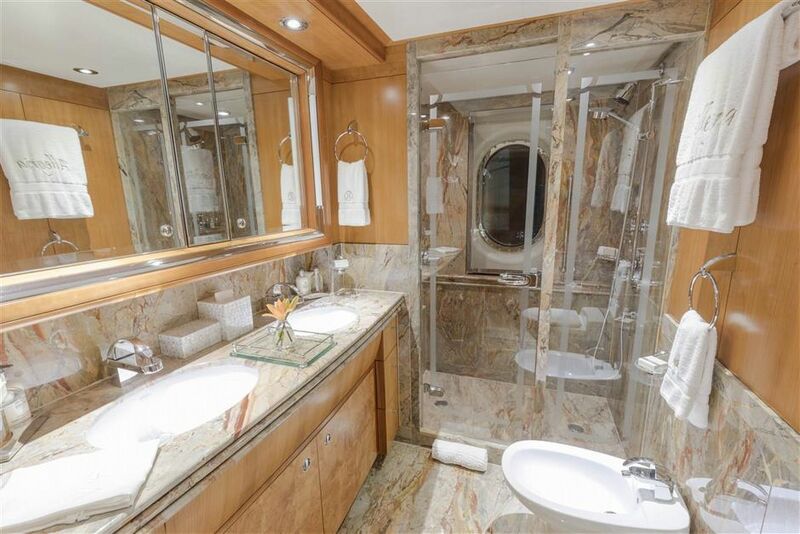 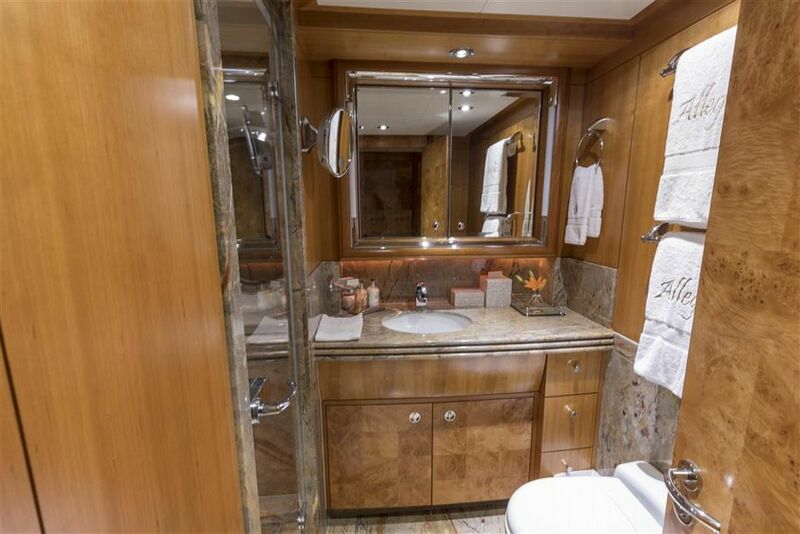 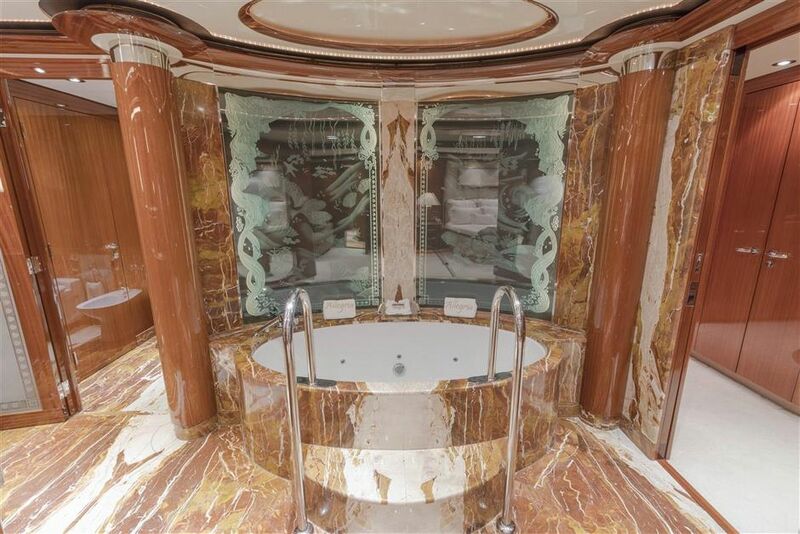 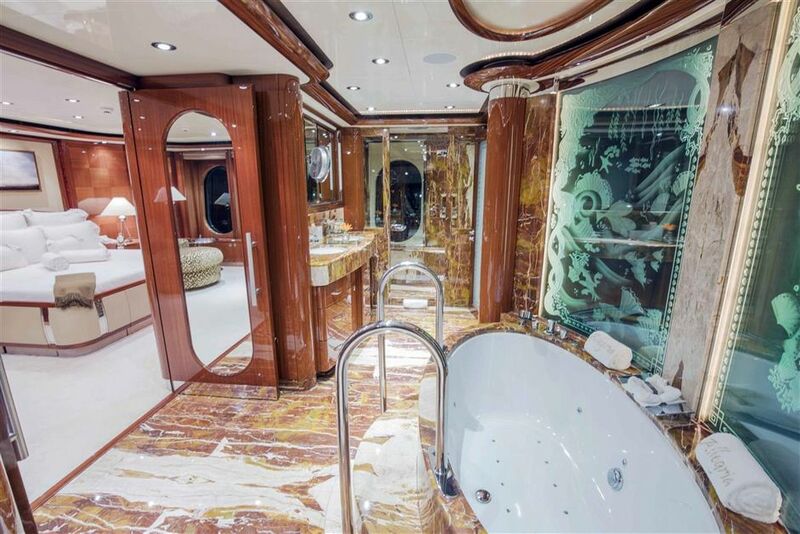 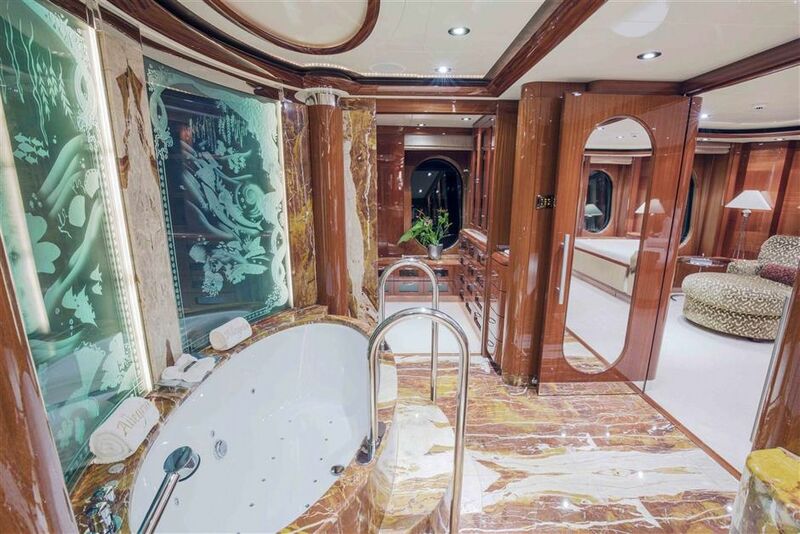 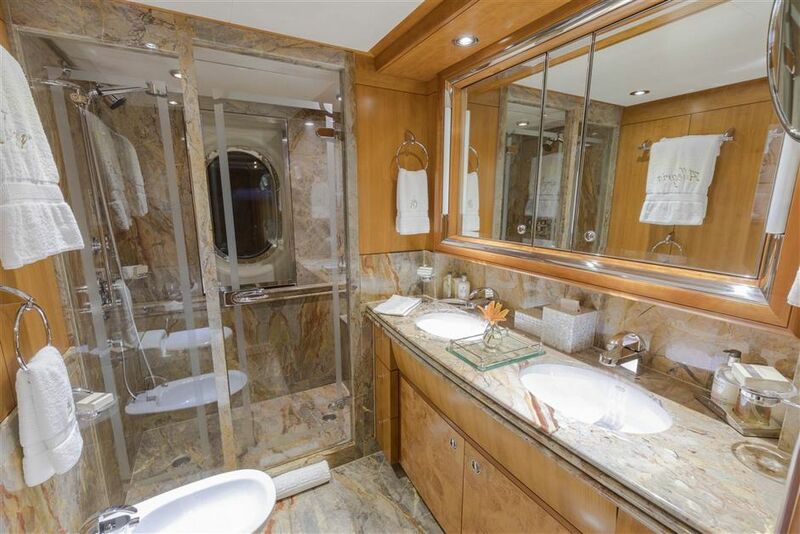 On the main deck forward is the master stateroom, featuring a king size bed, walk-in wardrobe, study and ensuite with jacuzzi, rain shower and his and hers sink. 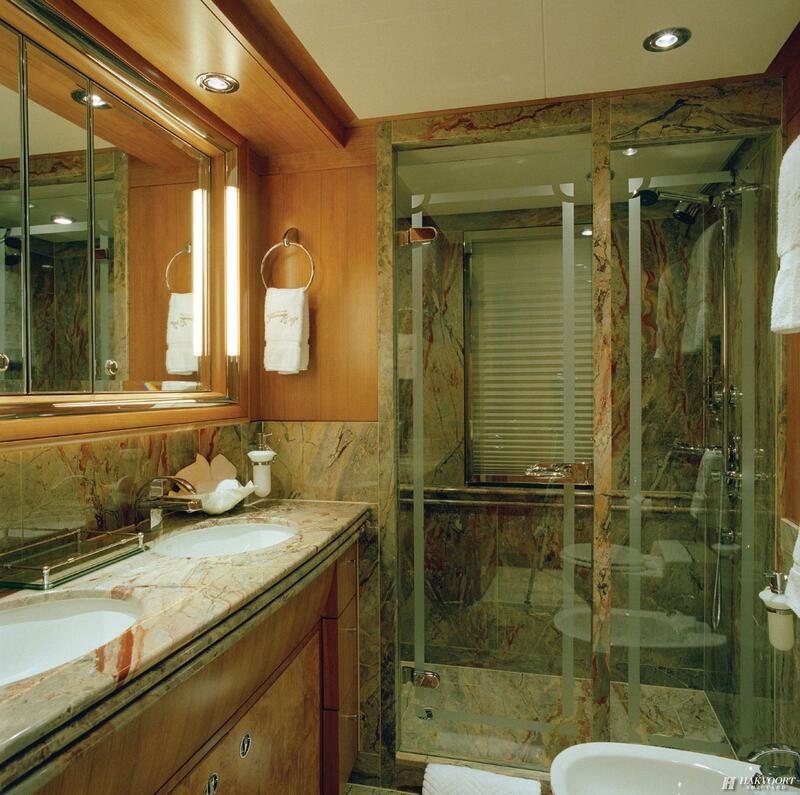 On the lower deck are 3 VIP cabins and one twin cabin, the twin cabins includes a Pullman berth. 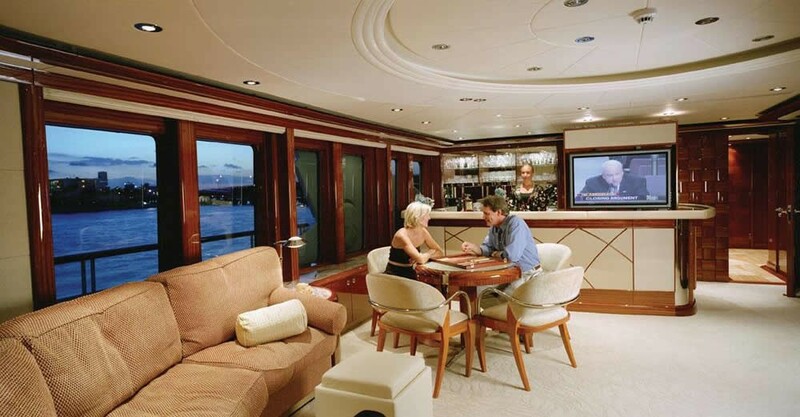 All cabins boast entertainment systems and are beautifully finished. 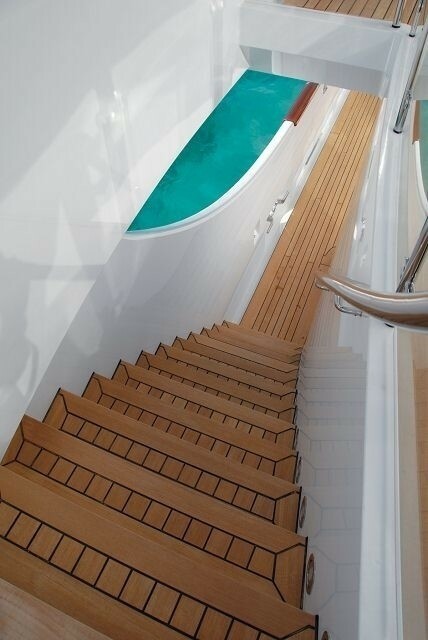 A gym is available on the lower deck. 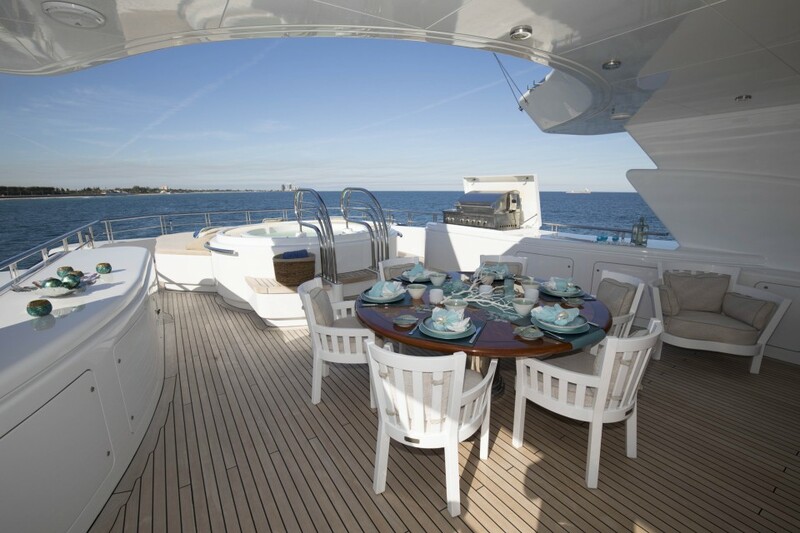 The exterior living is laid over three generous decks. 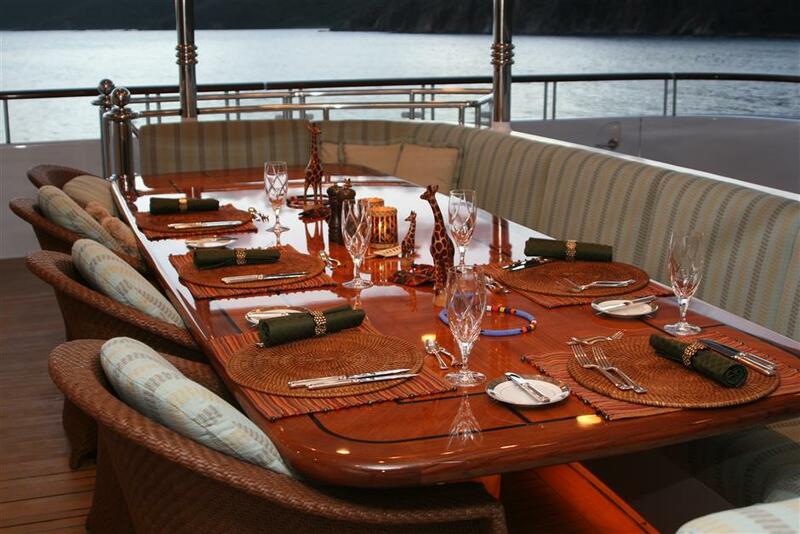 The main deck has an alfresco dining option aft. 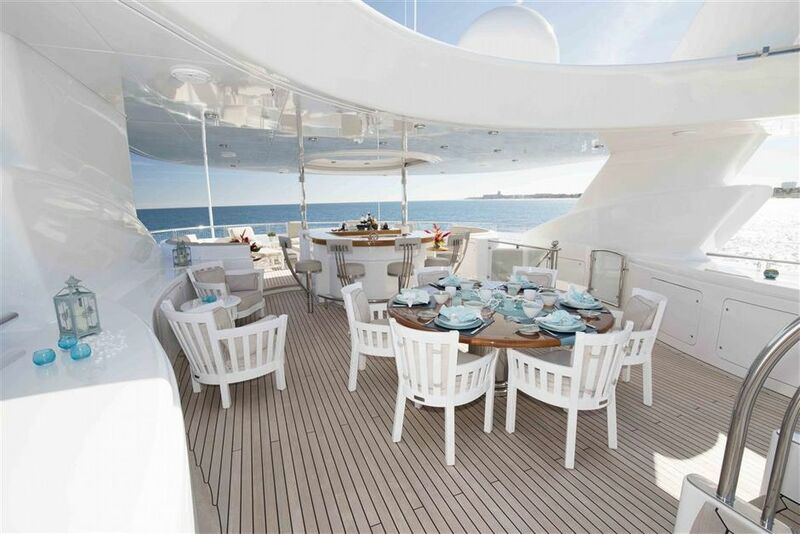 With two tables and plenty of seating. 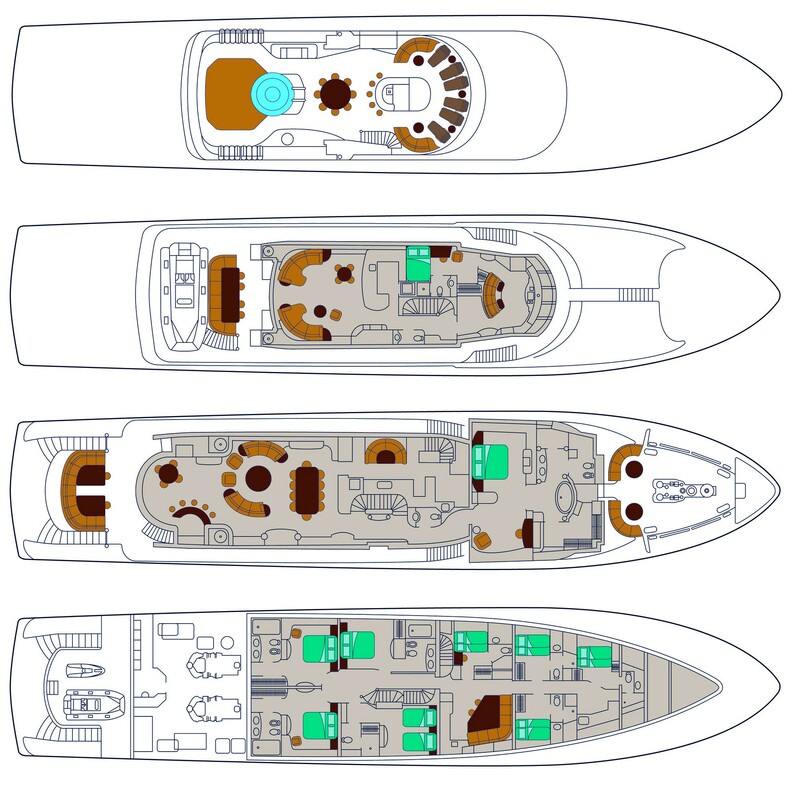 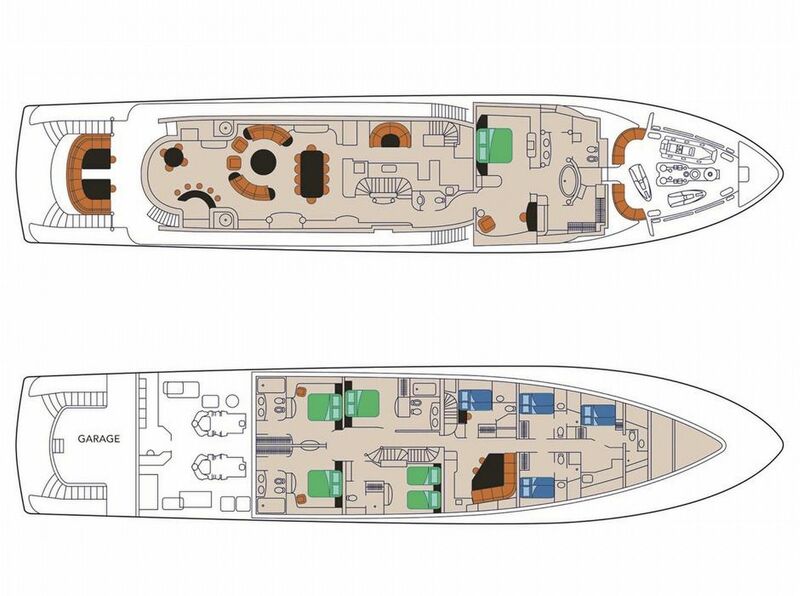 Space is shaded and offers direct access to the main salon and extended swim platform on the stern. 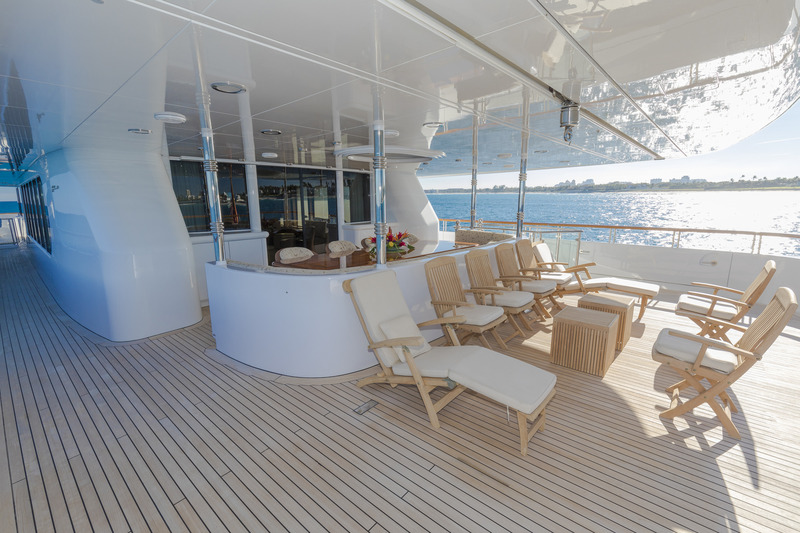 Above, the bridge deck aft features a further alfresco dining area with shade, chaise loungers and is adjacent to the sky lounge. 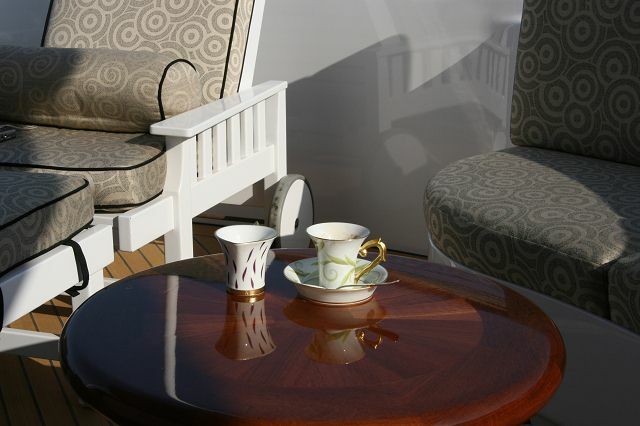 A forward deck is easily accessed from the bridge deck and offers a comfortable built-in seating area. 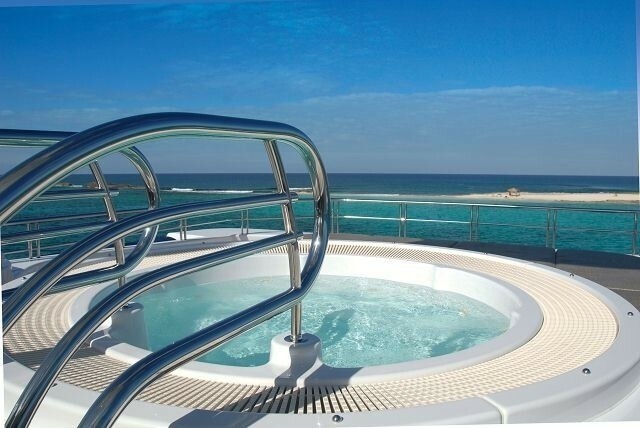 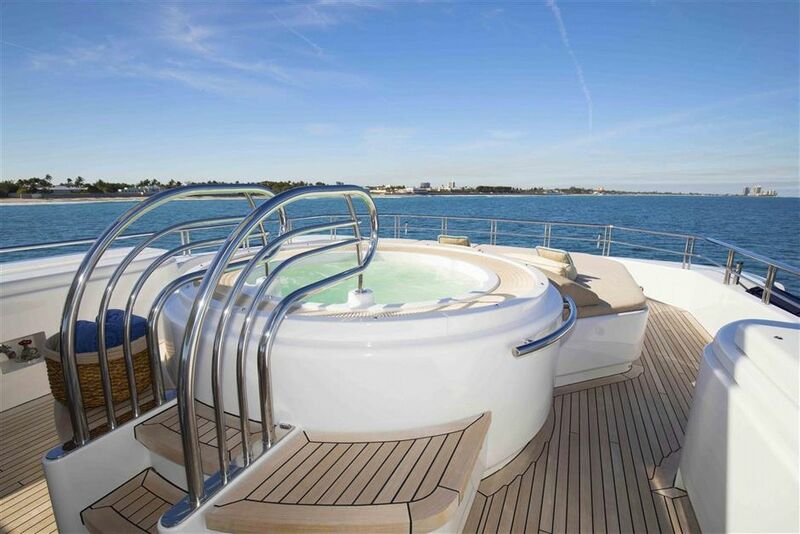 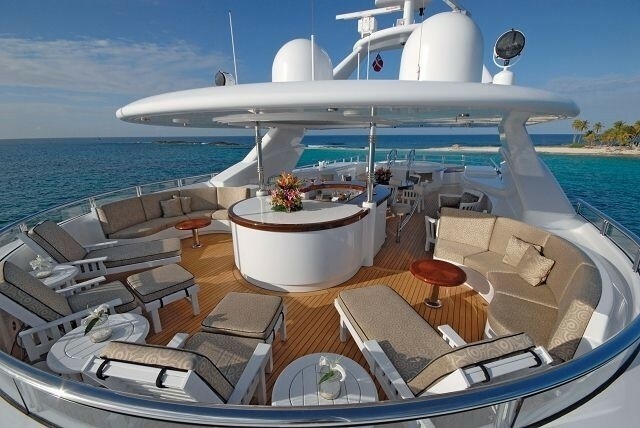 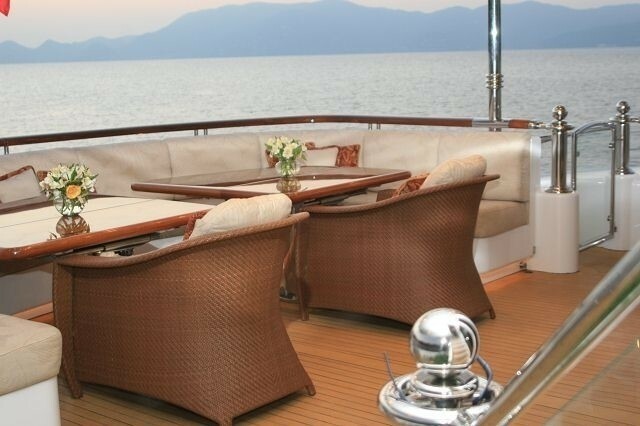 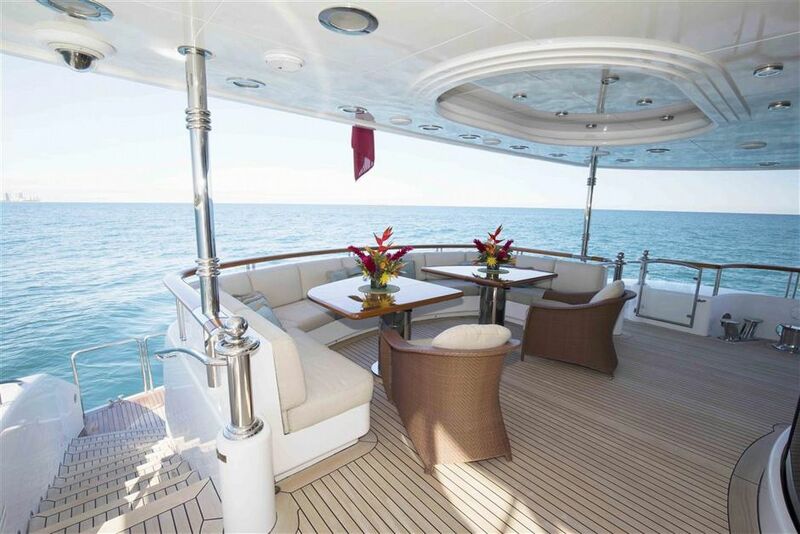 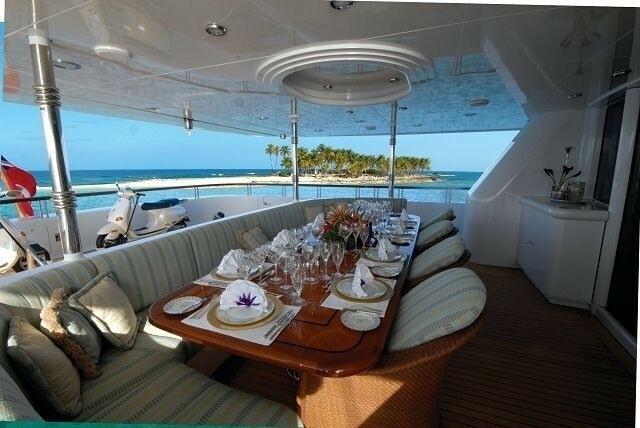 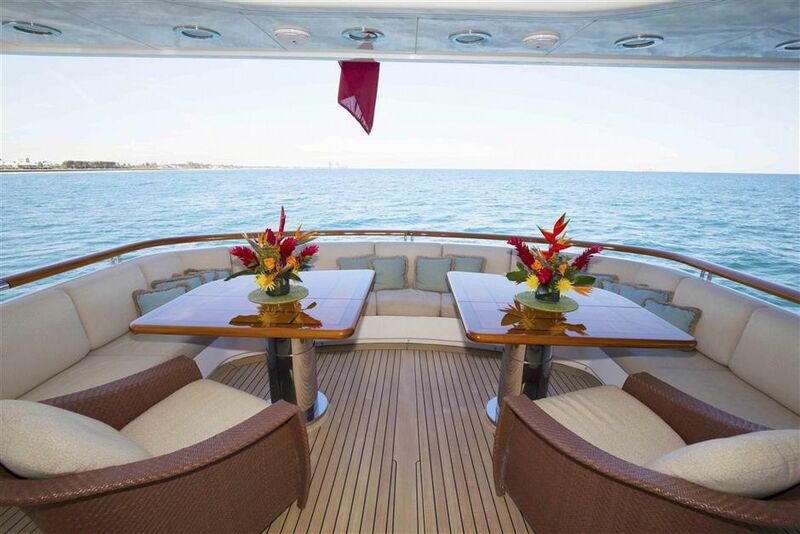 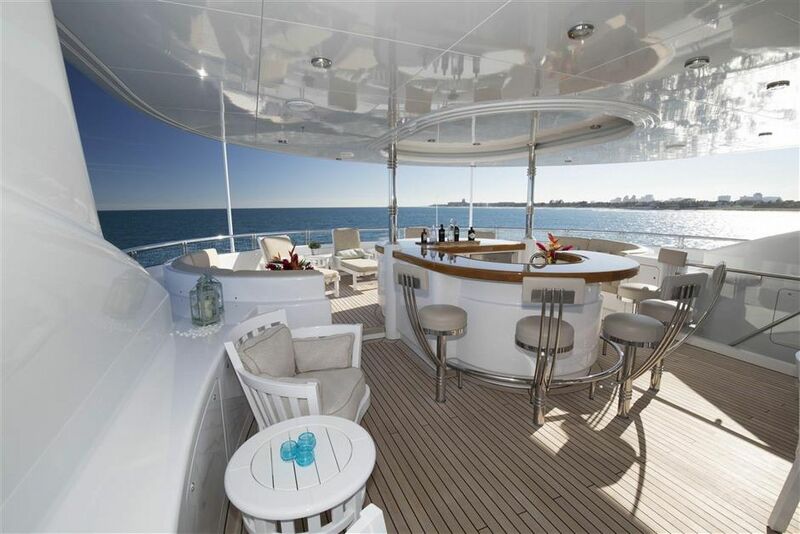 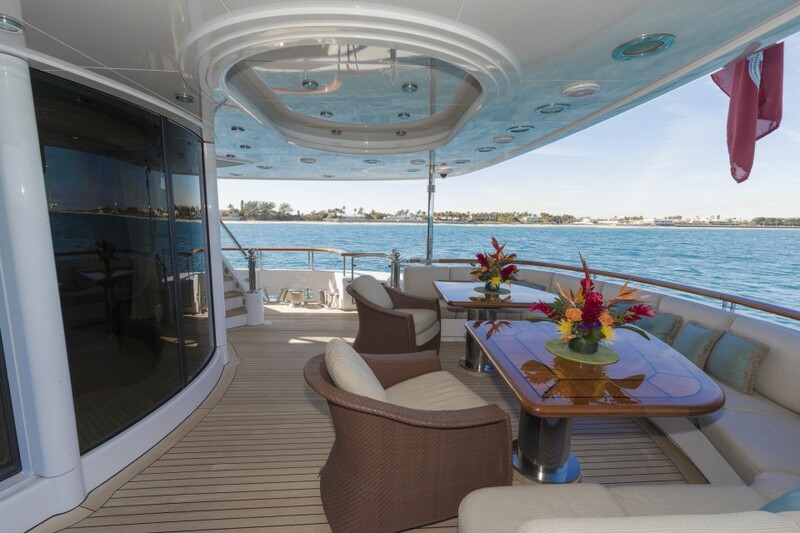 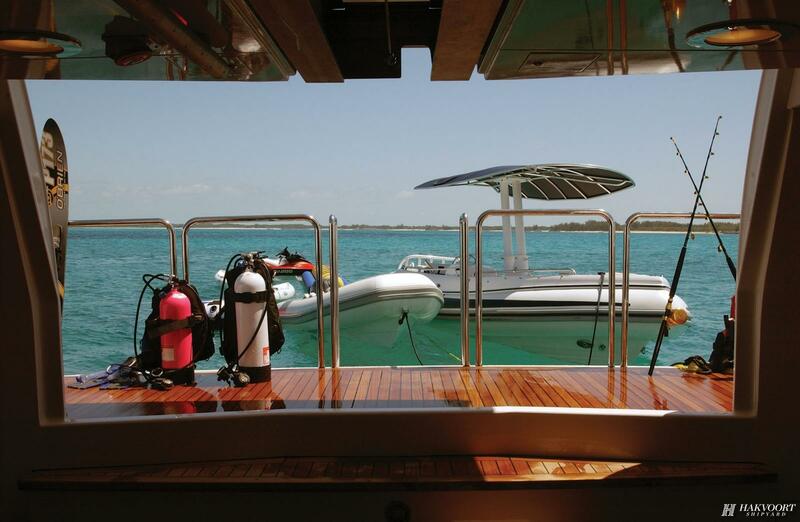 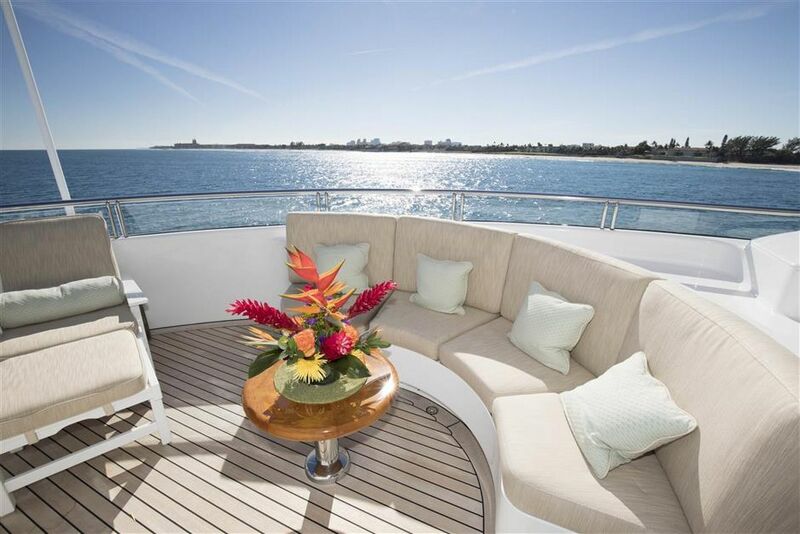 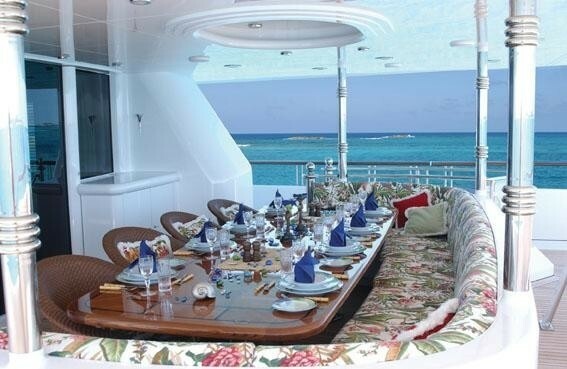 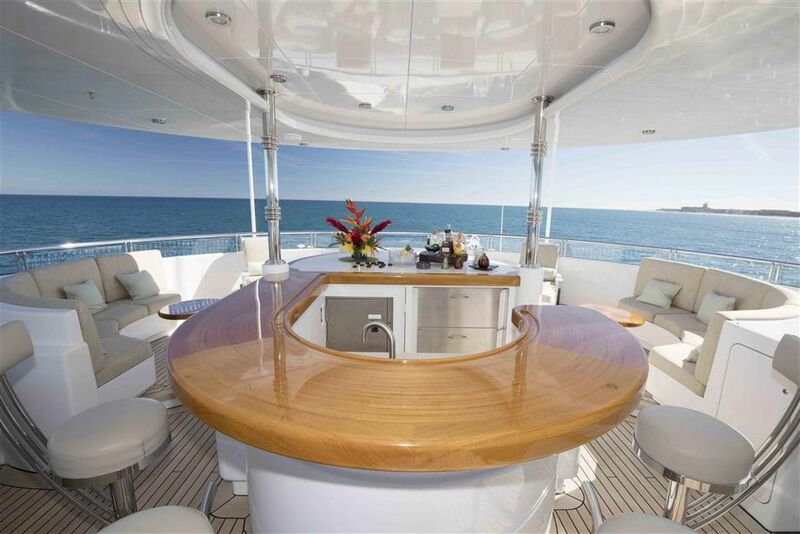 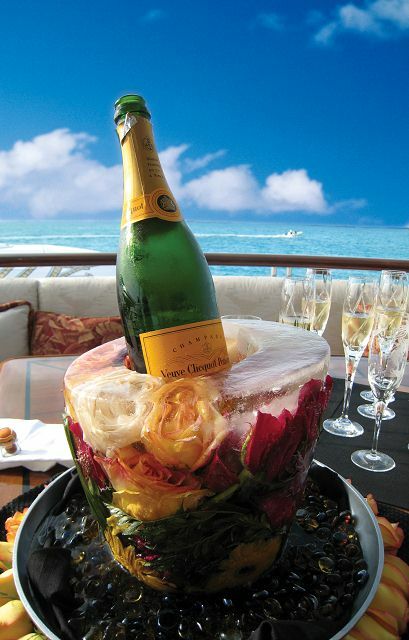 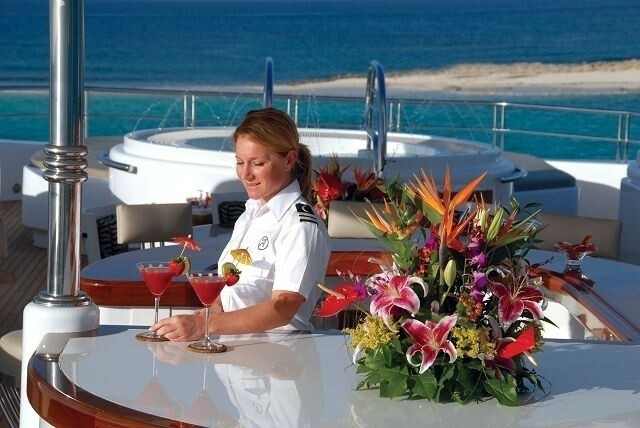 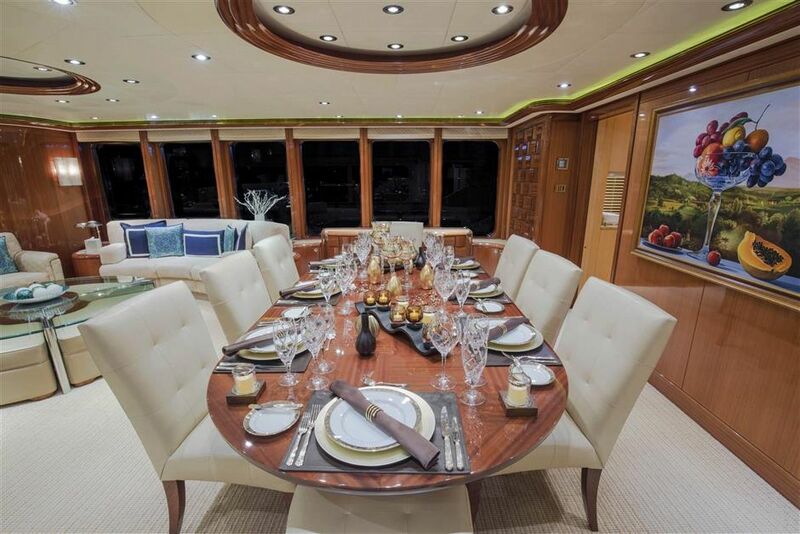 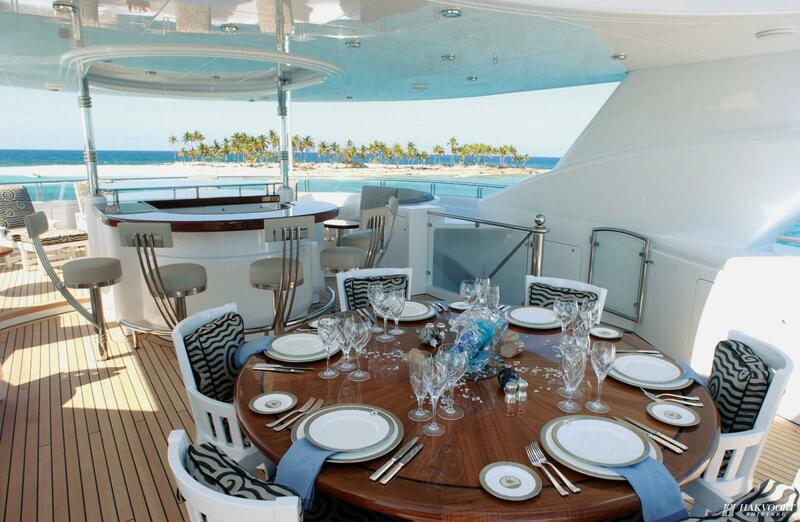 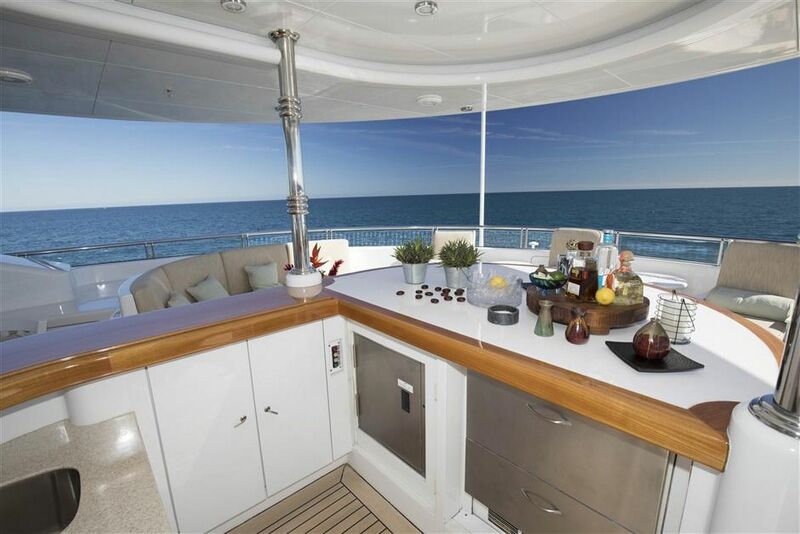 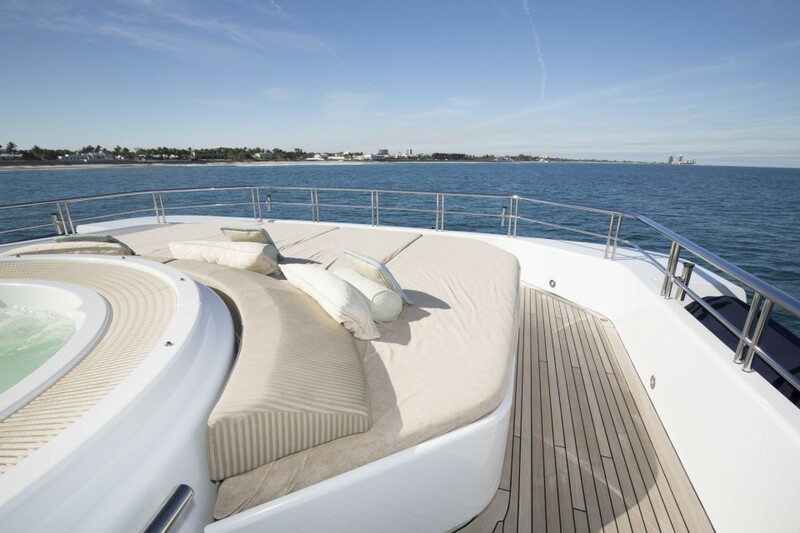 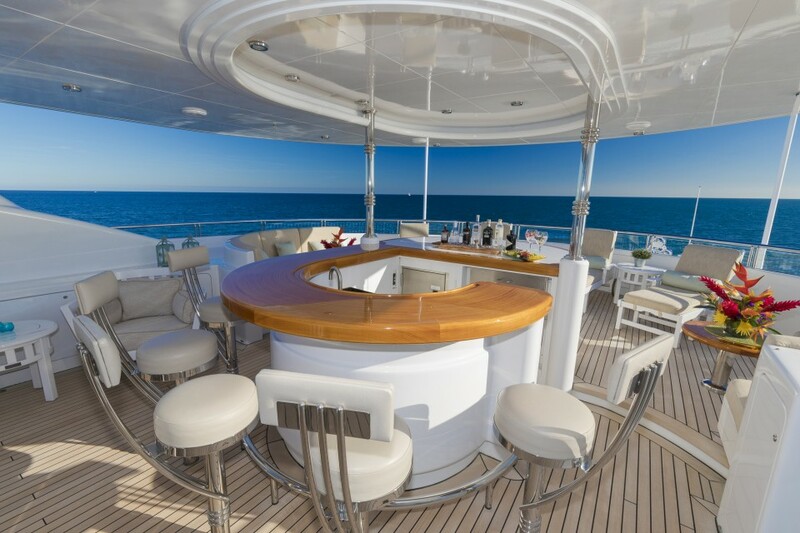 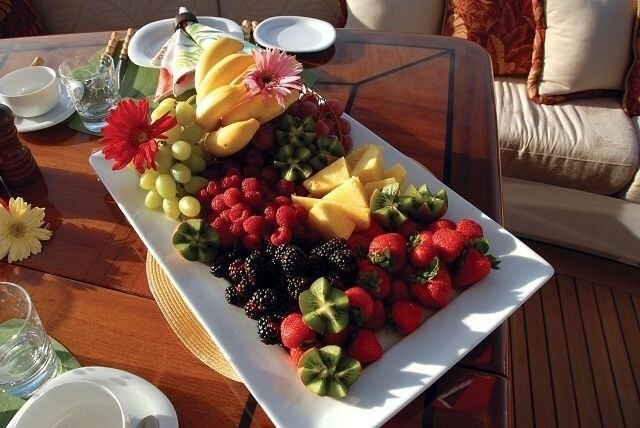 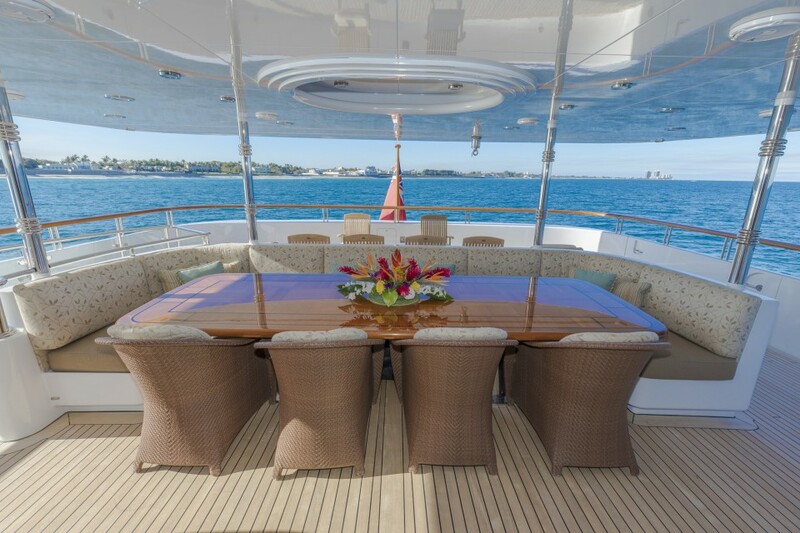 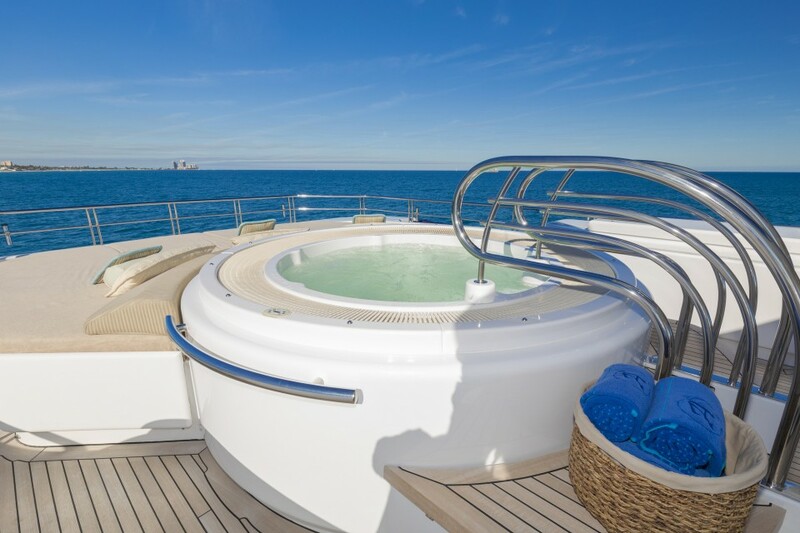 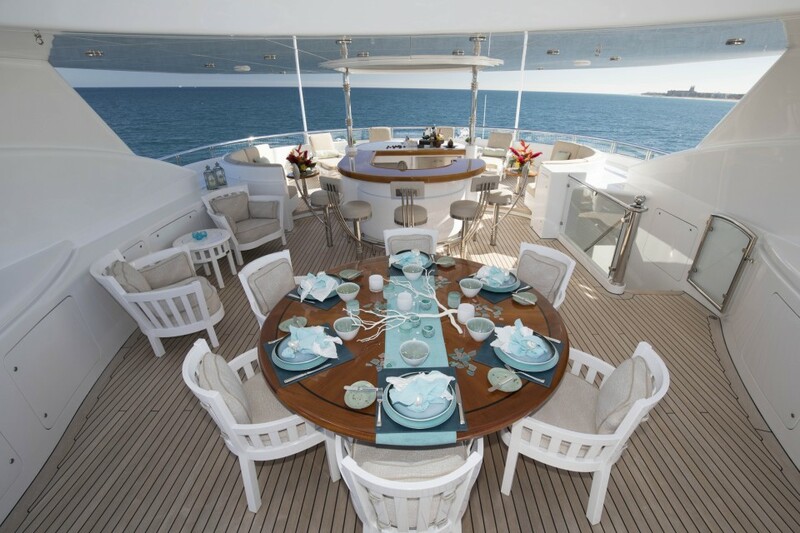 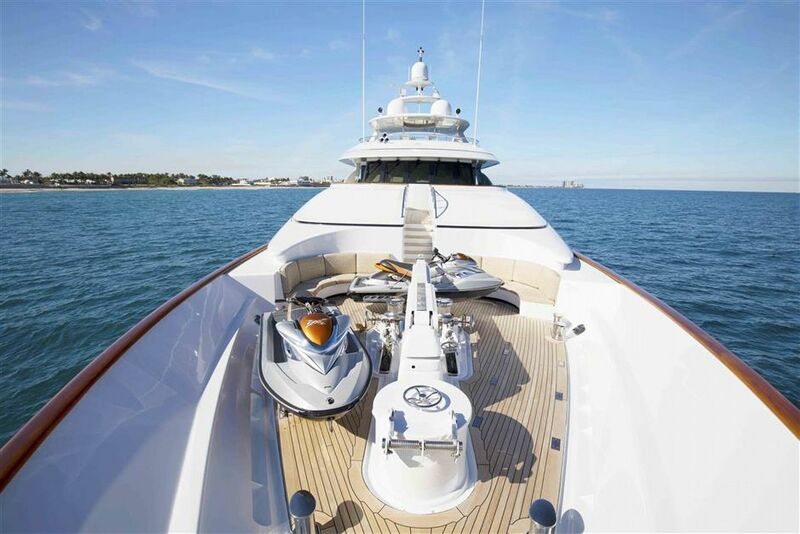 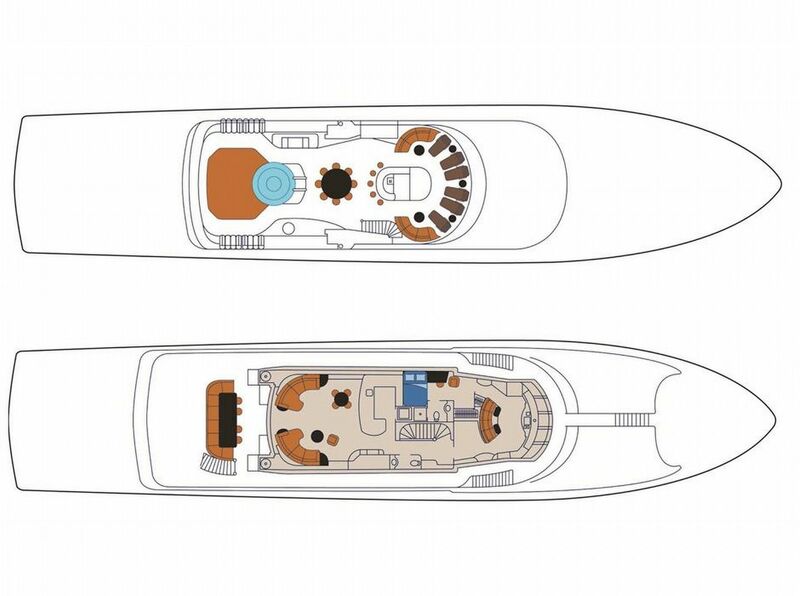 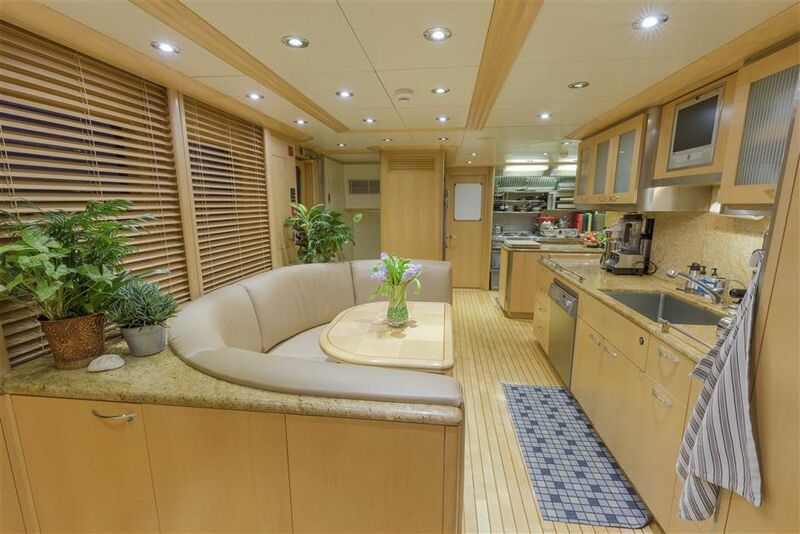 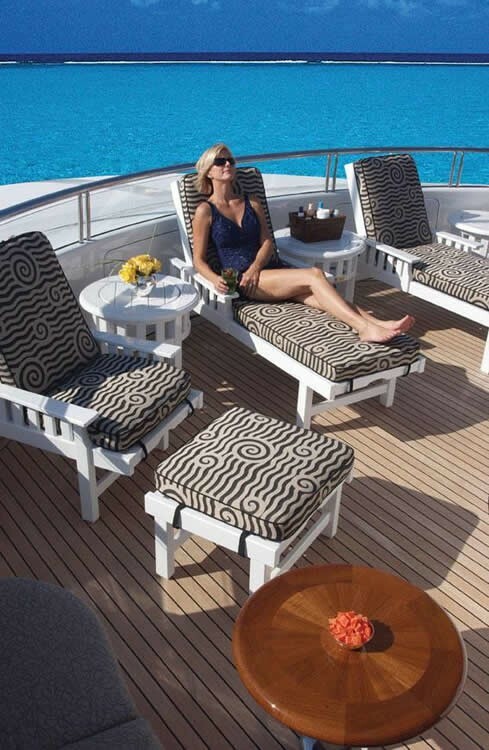 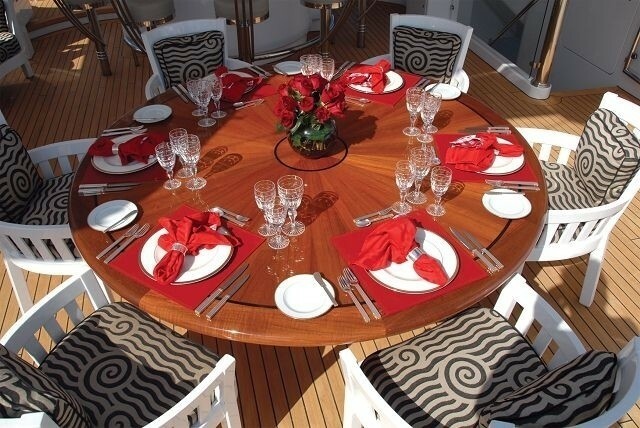 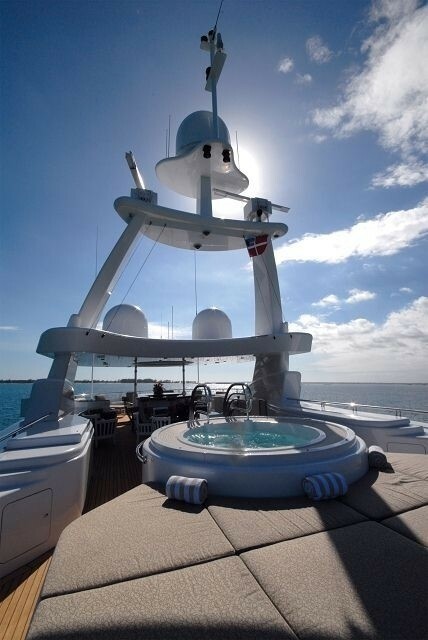 The yachts sundeck is ideal for entertaining and relaxing. 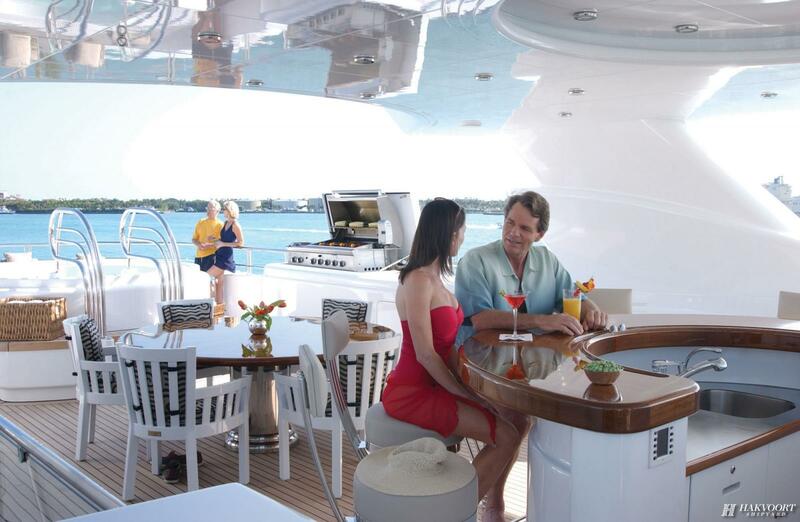 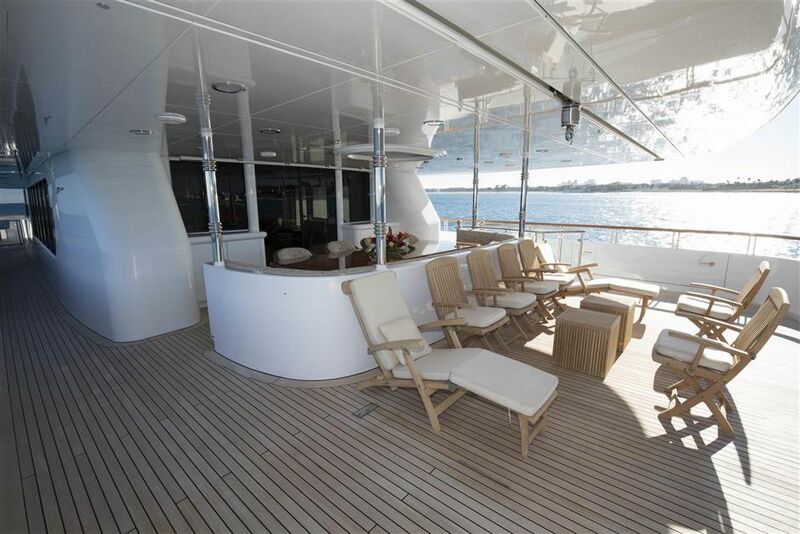 The forward section of the sundeck has a wet bar, built-in seating and chaise loungers. 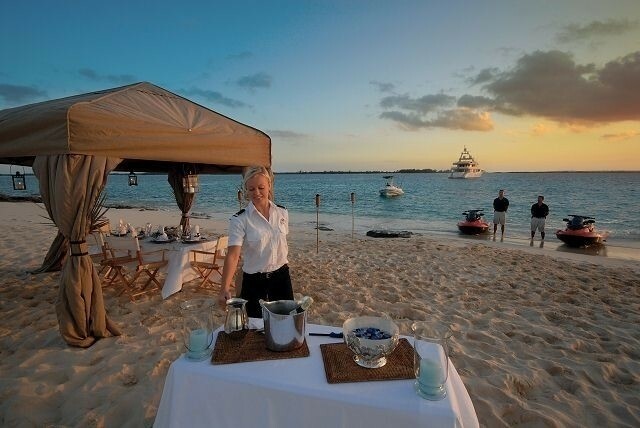 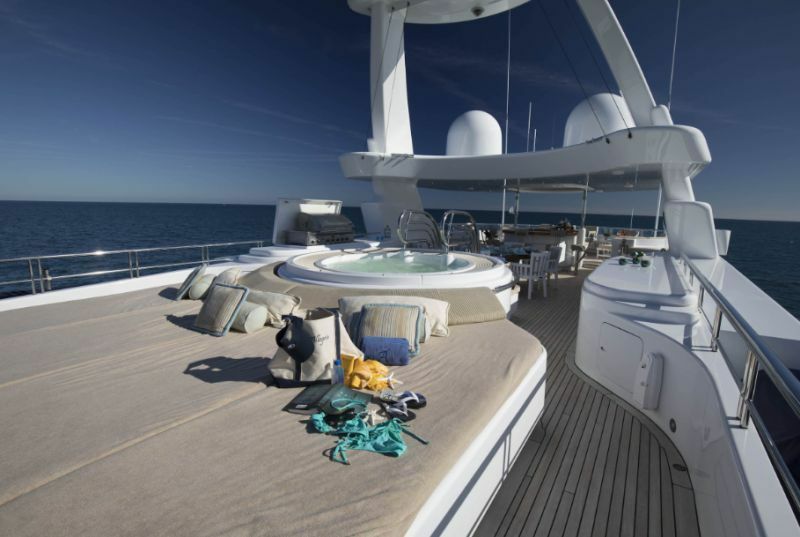 The aft area offers a casual alfresco dining area, BBQ service station and raised Jacuzzi tub with oversized sun pads. 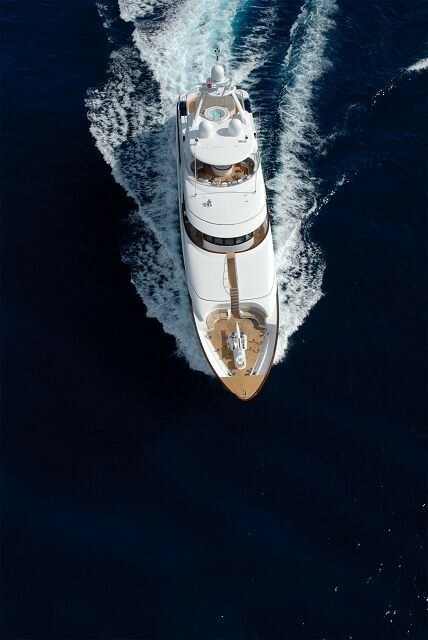 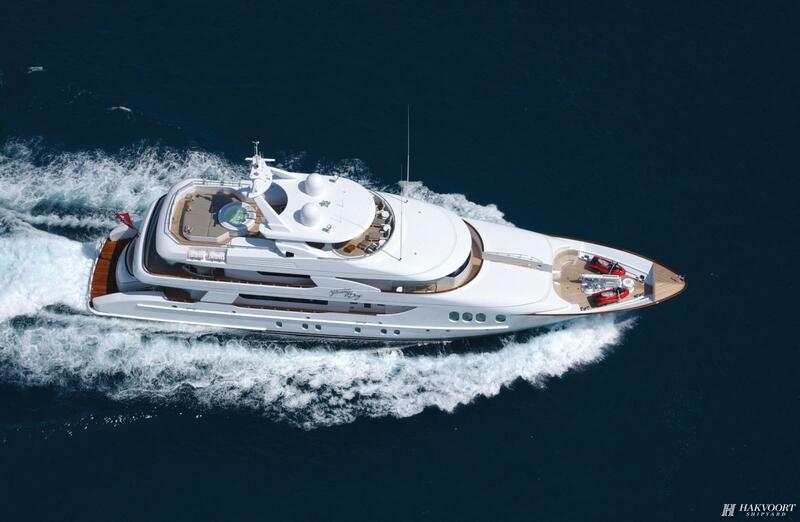 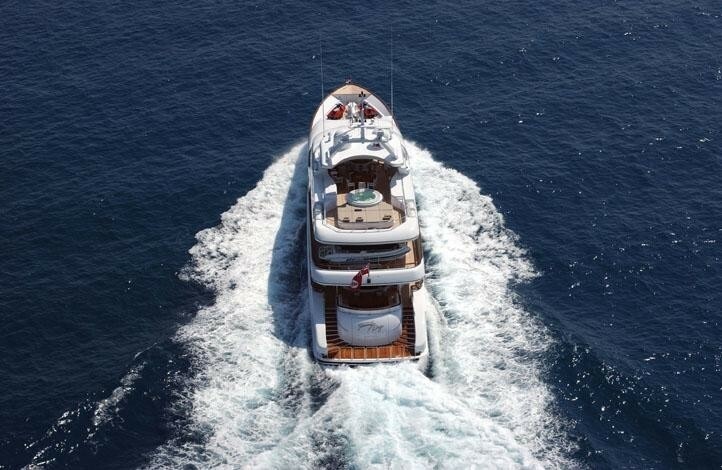 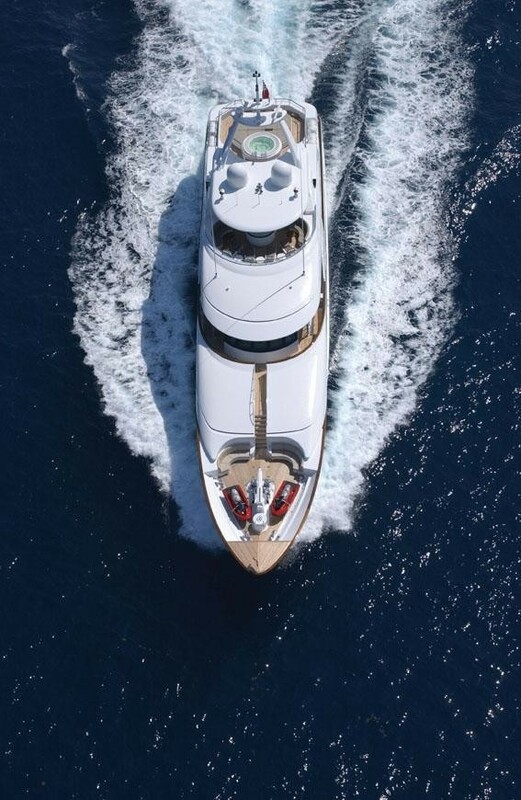 Powered by an x 3508B Caterpillar engines, AMICA MEA cruises at 11 knots and has top speeds of 14 knots. 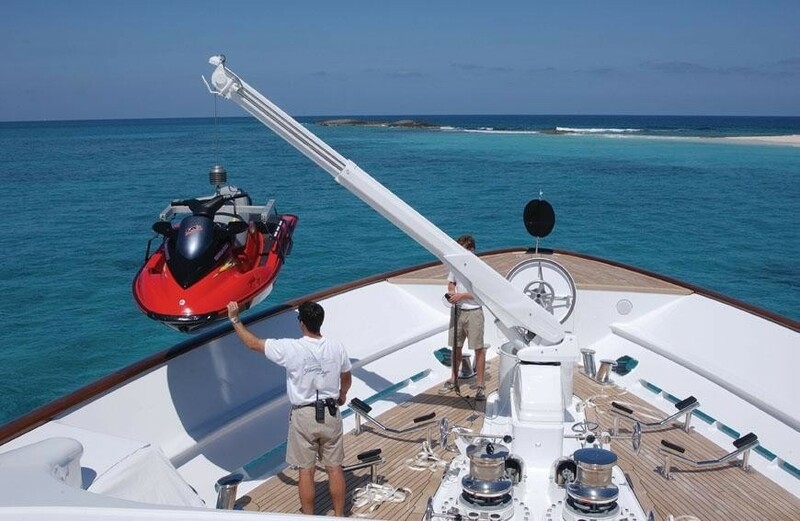 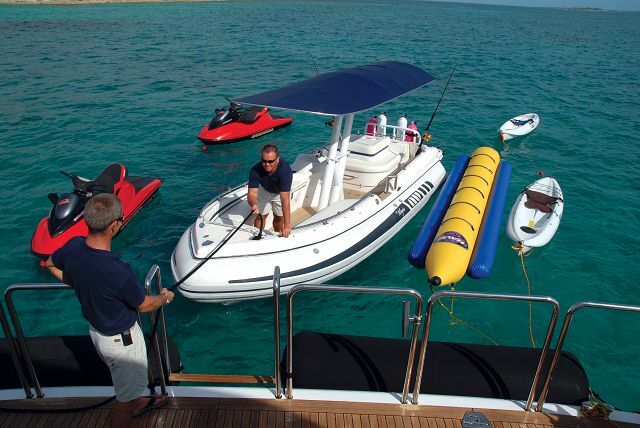 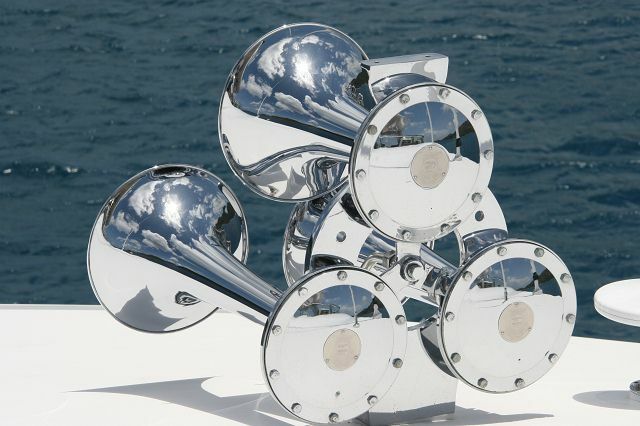 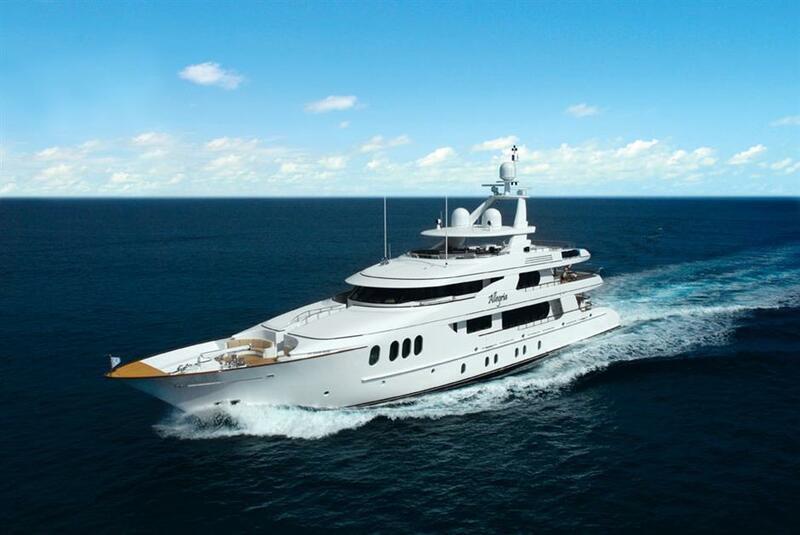 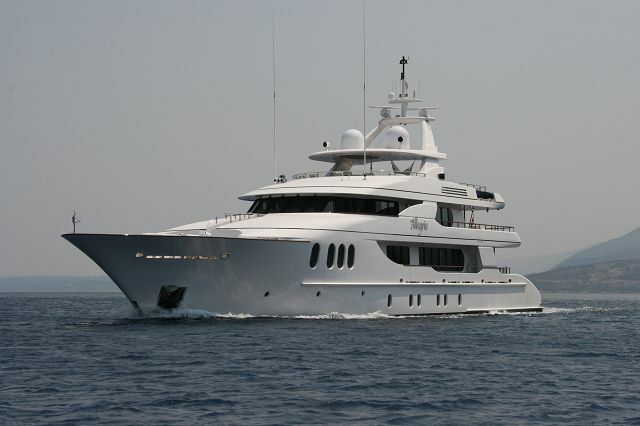 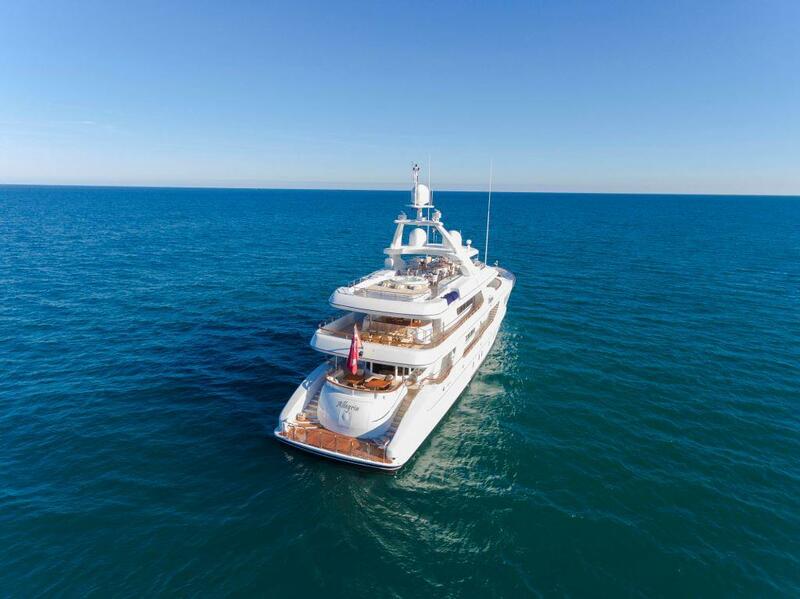 She is fitted with both at anchor and underway stabilizers, to ensure optimum comfort. 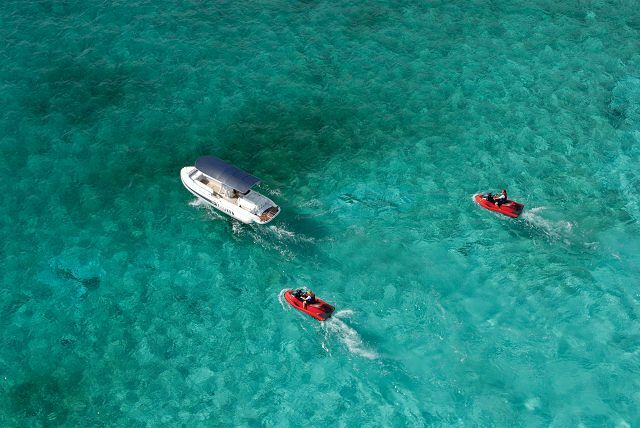 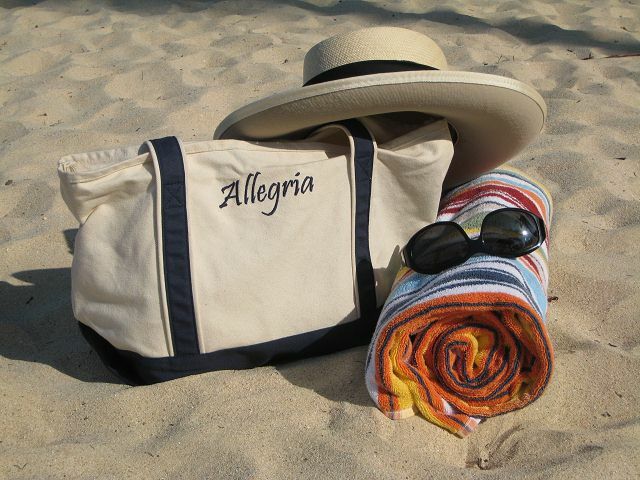 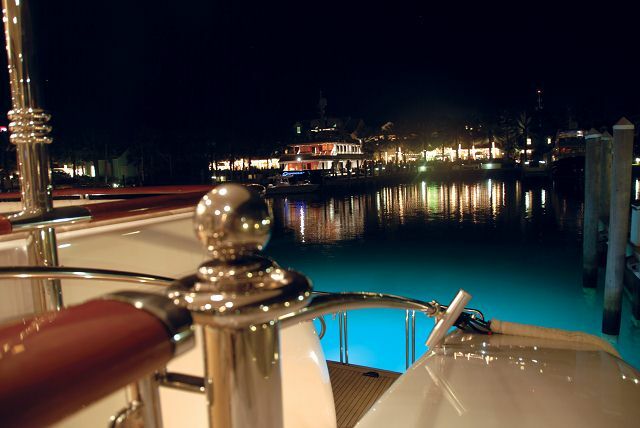 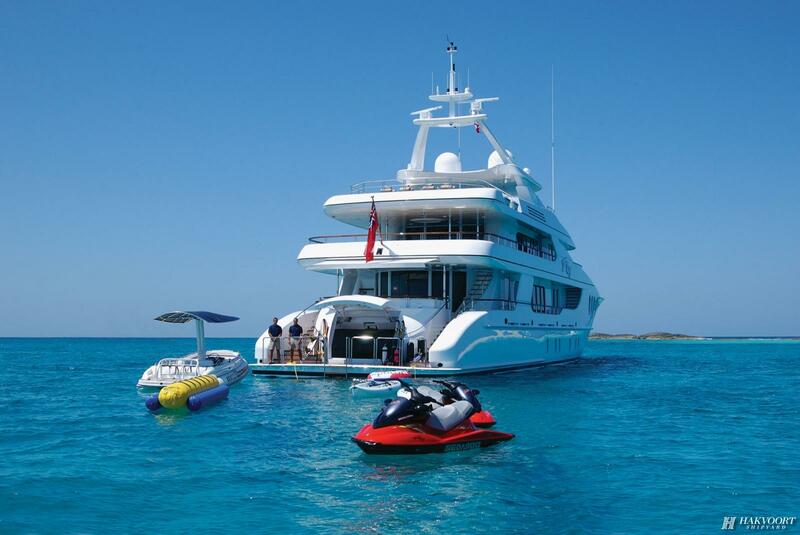 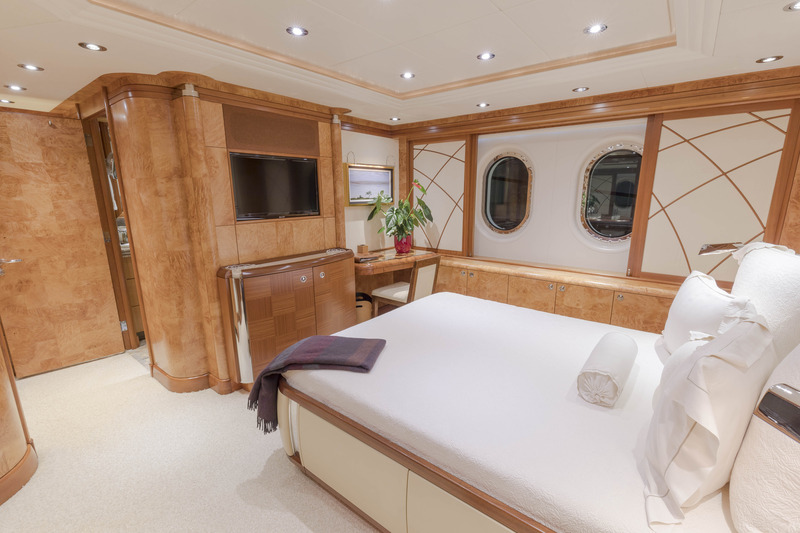 Luxury accommodation is provided in 5 ensuite cabins, for up to 11 guests. 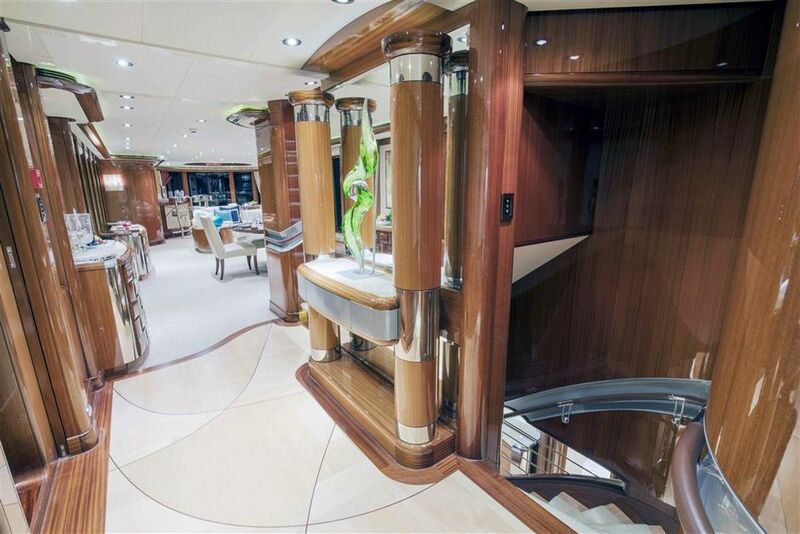 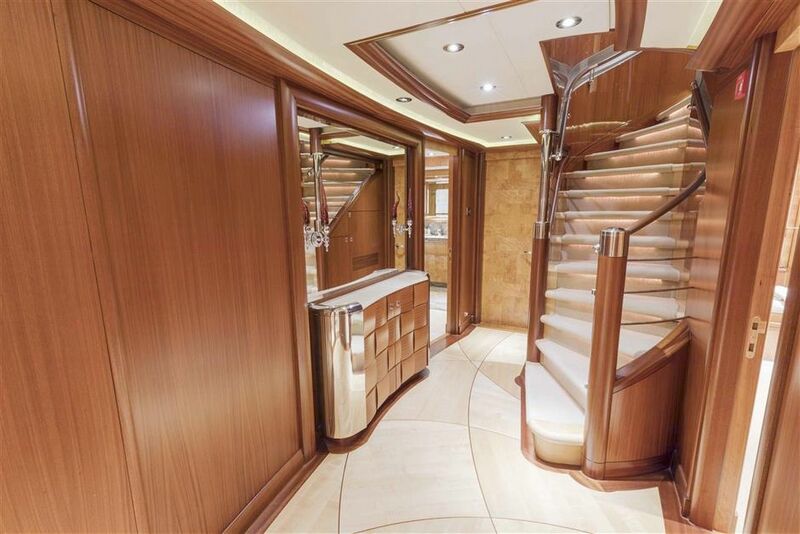 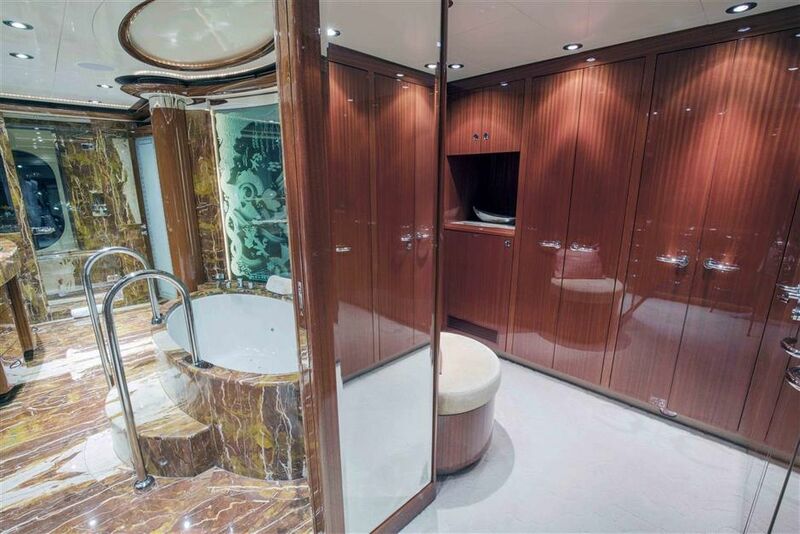 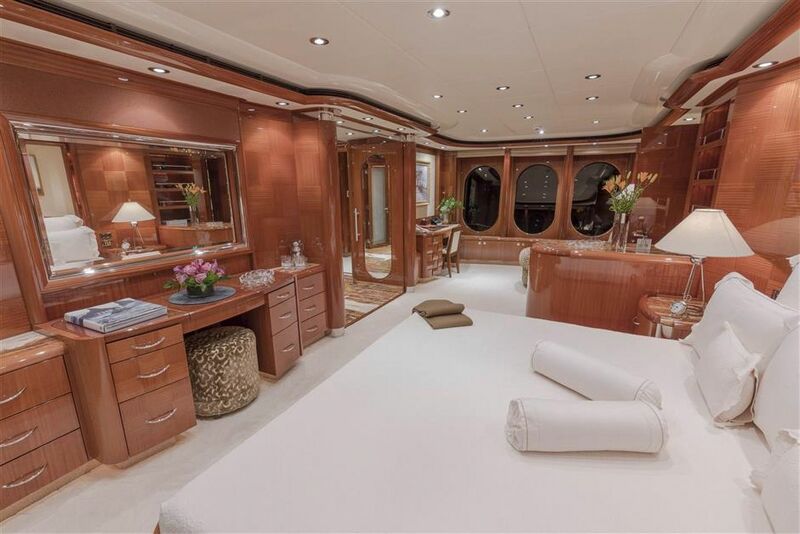 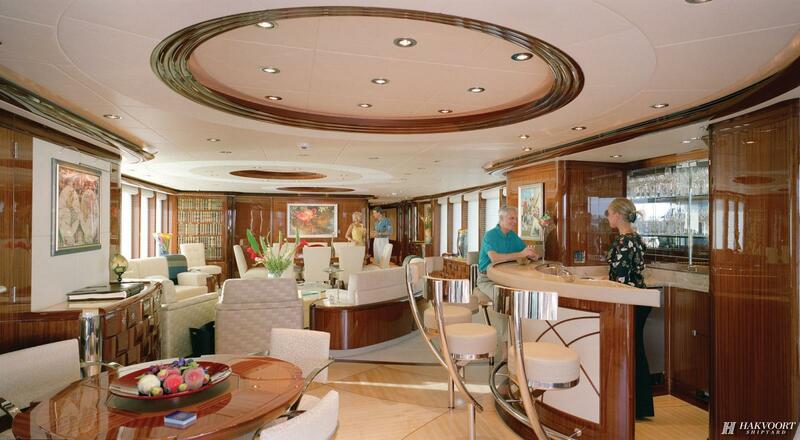 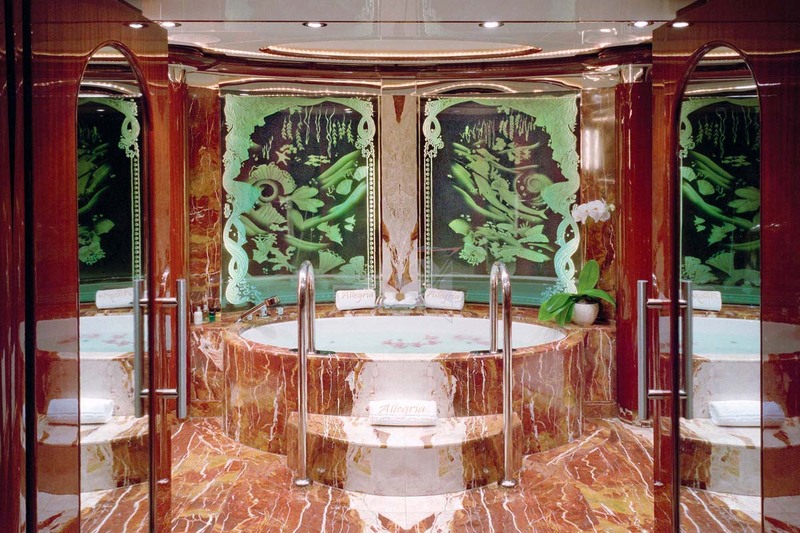 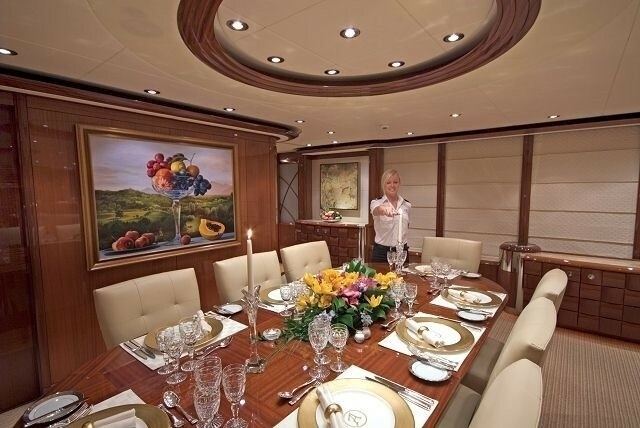 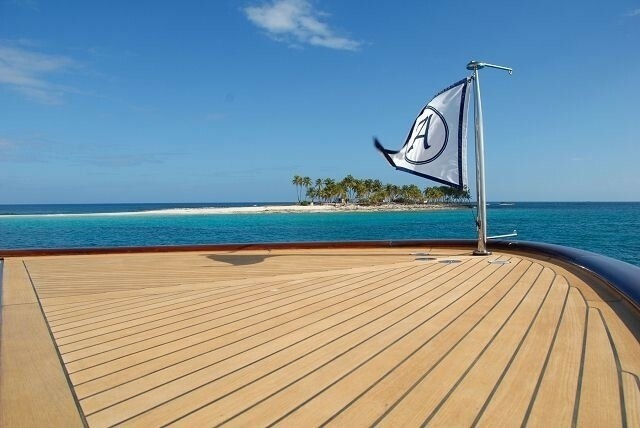 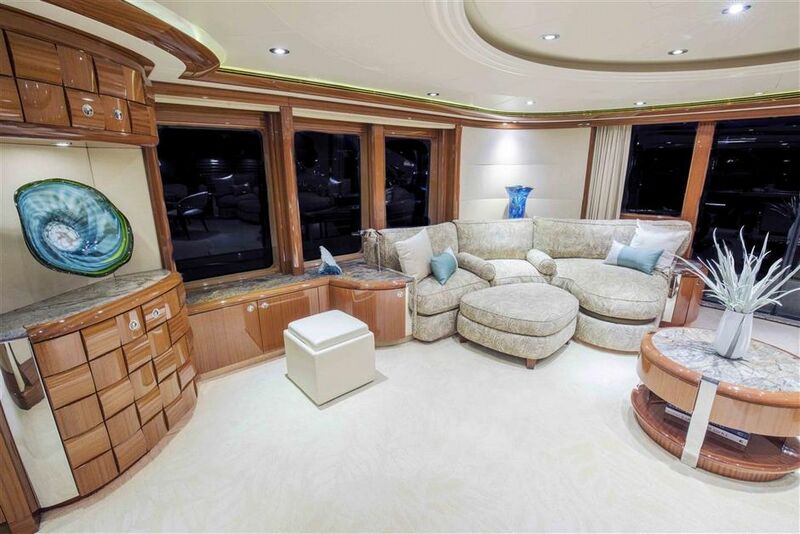 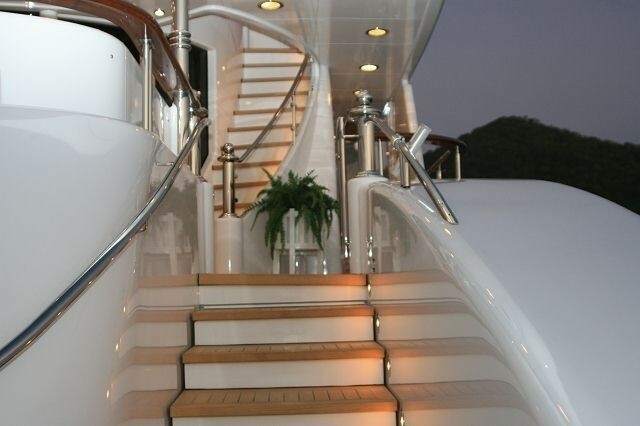 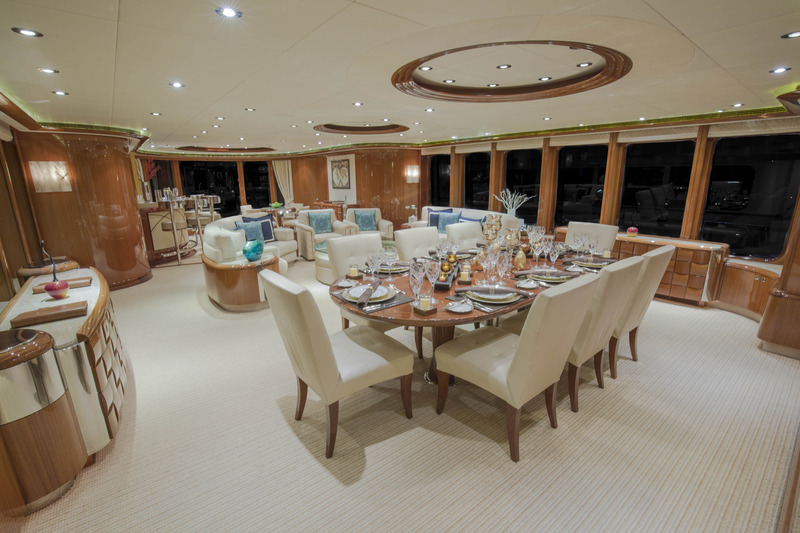 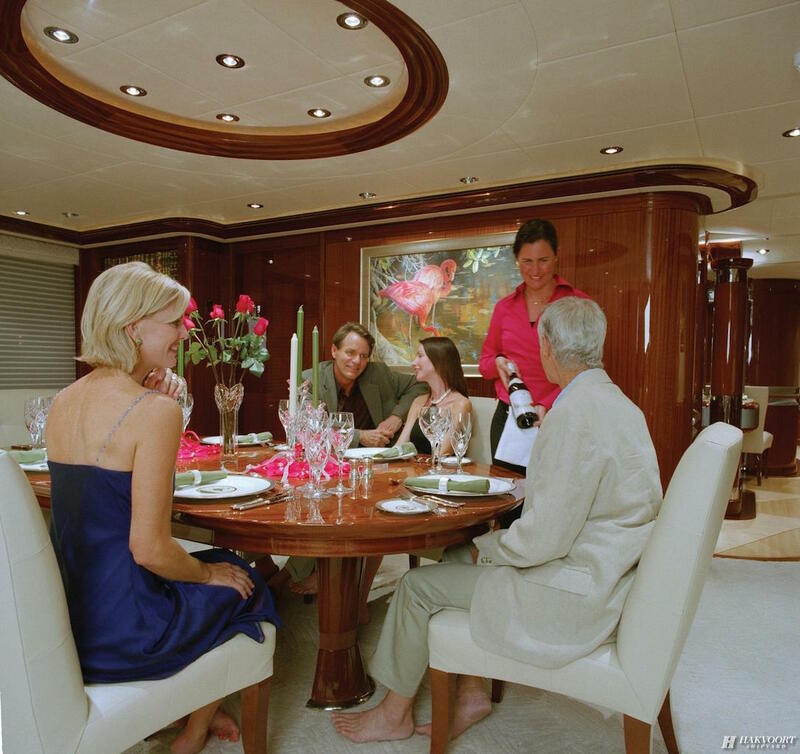 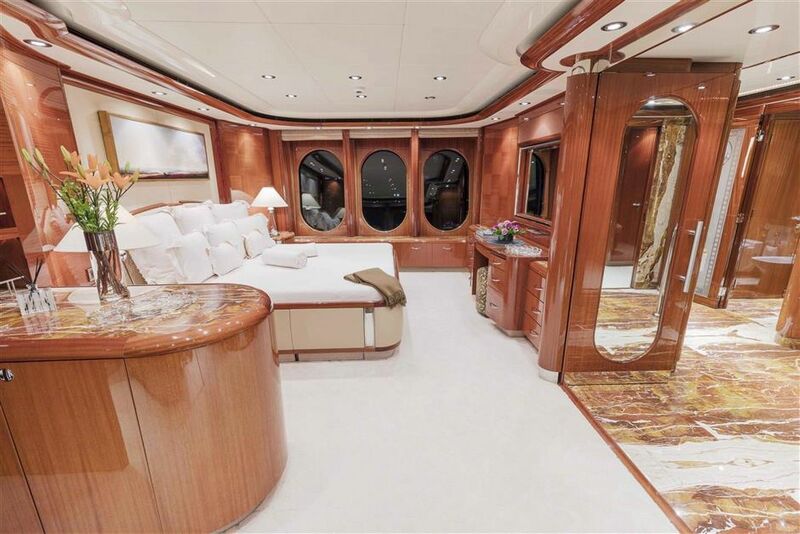 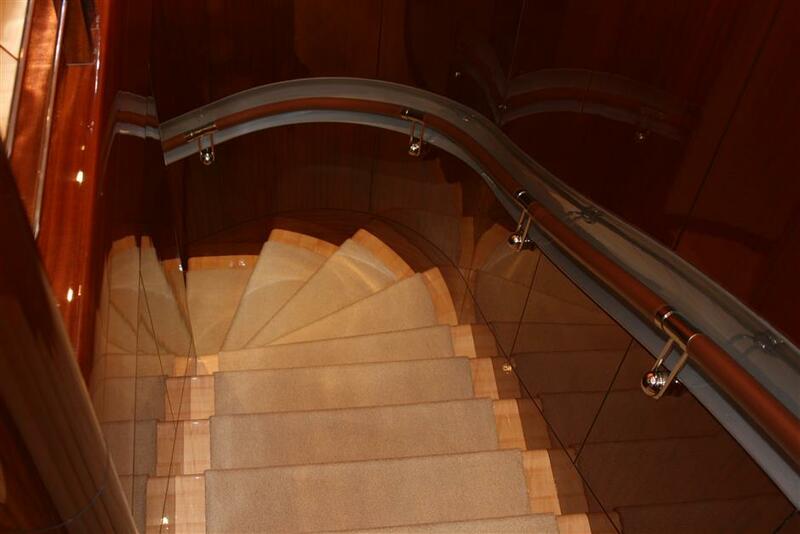 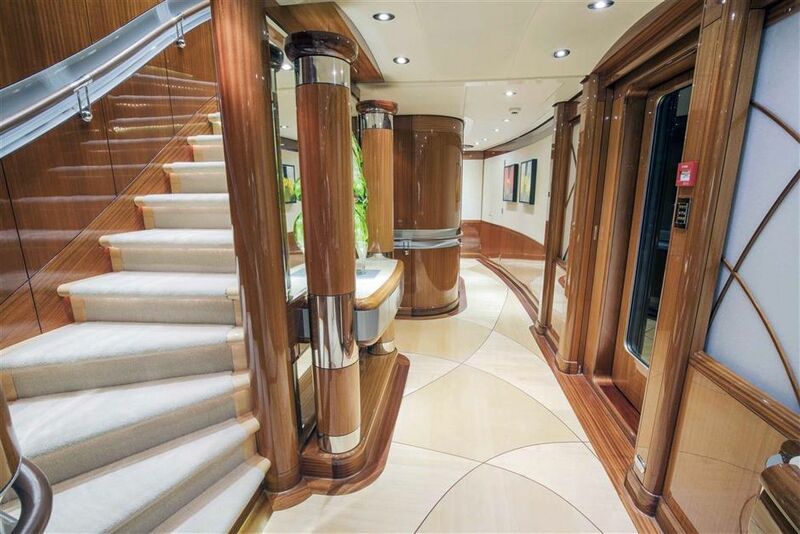 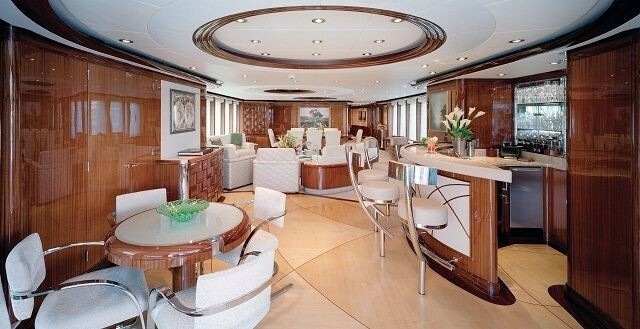 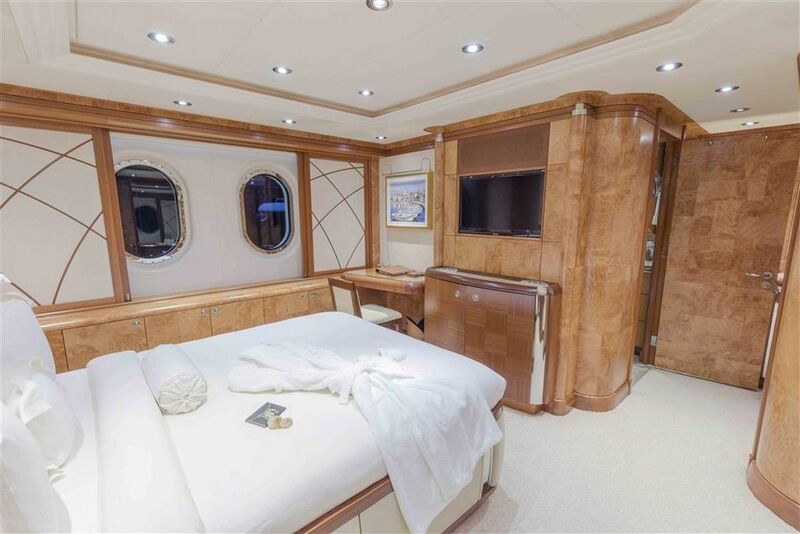 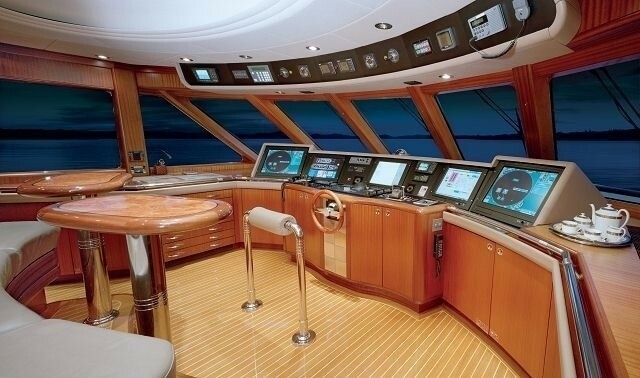 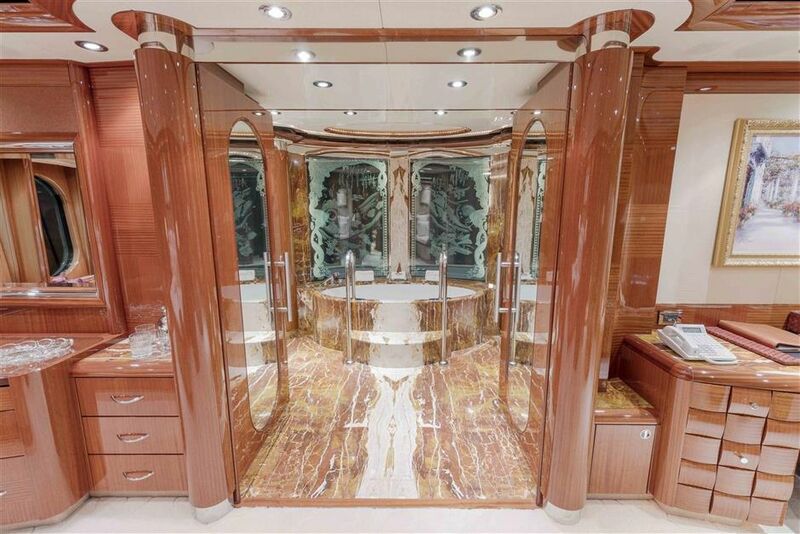 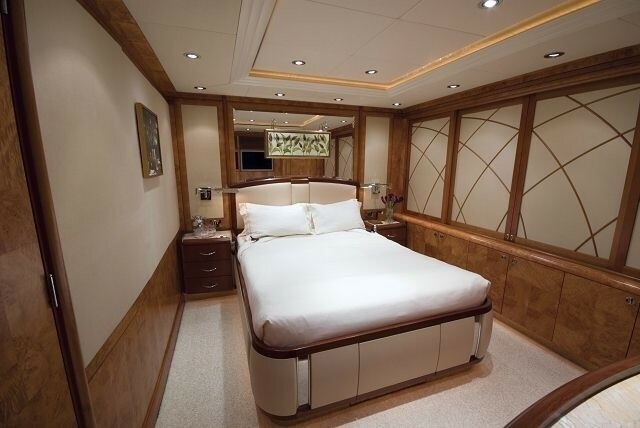 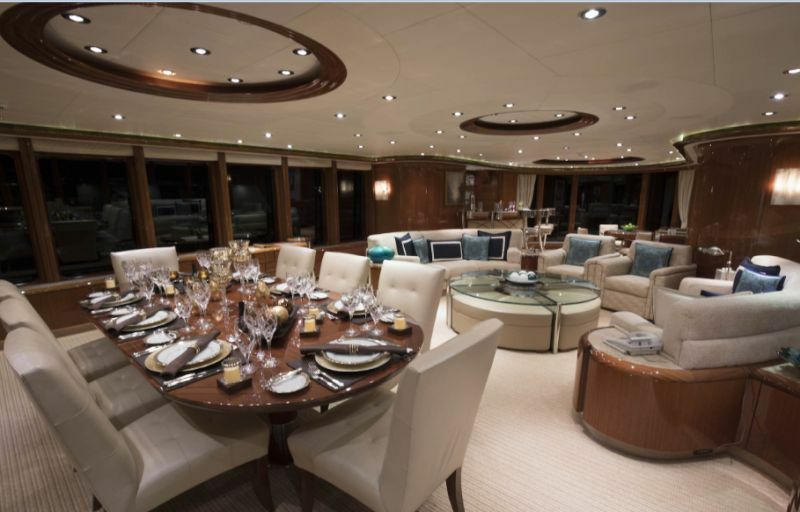 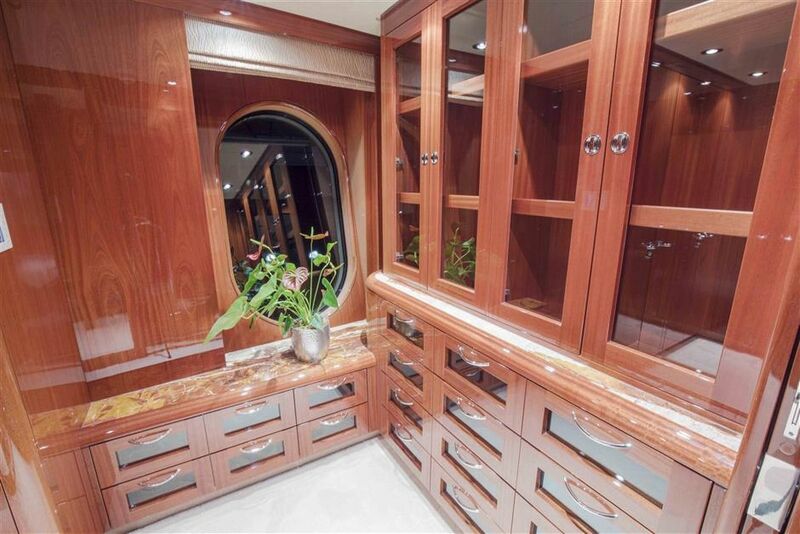 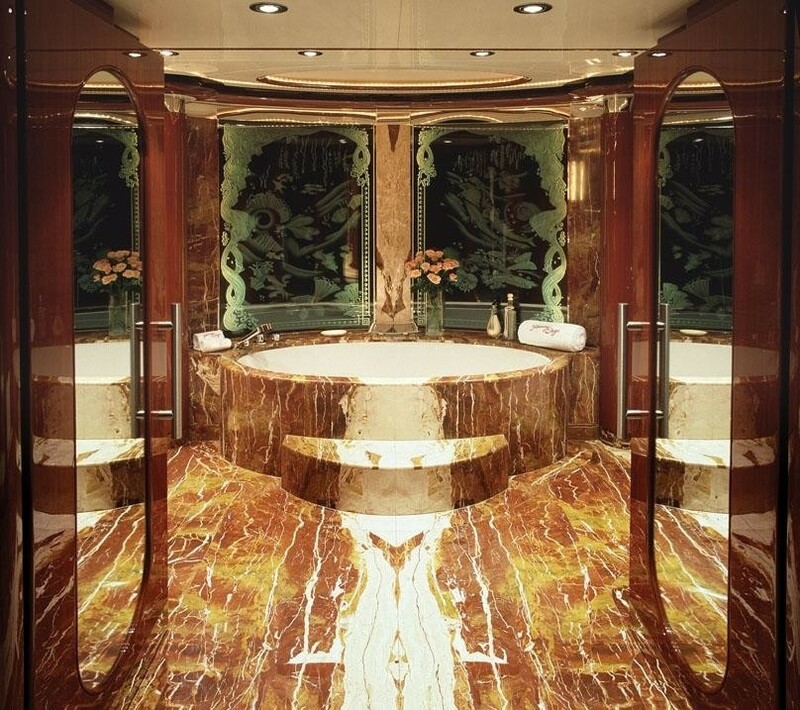 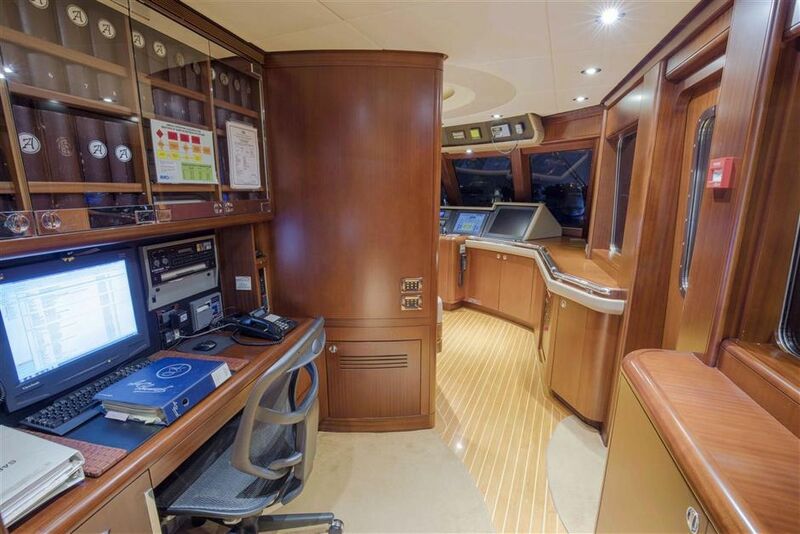 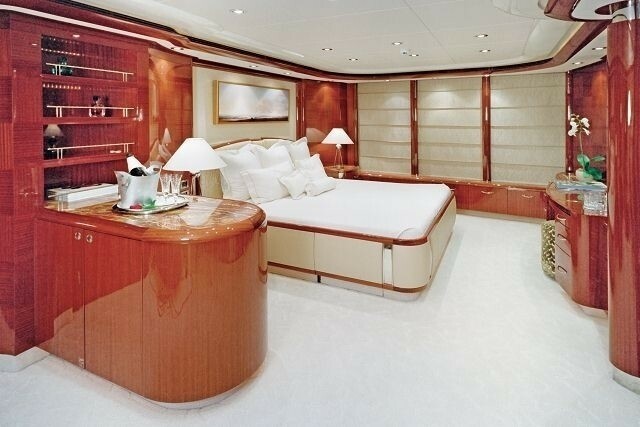 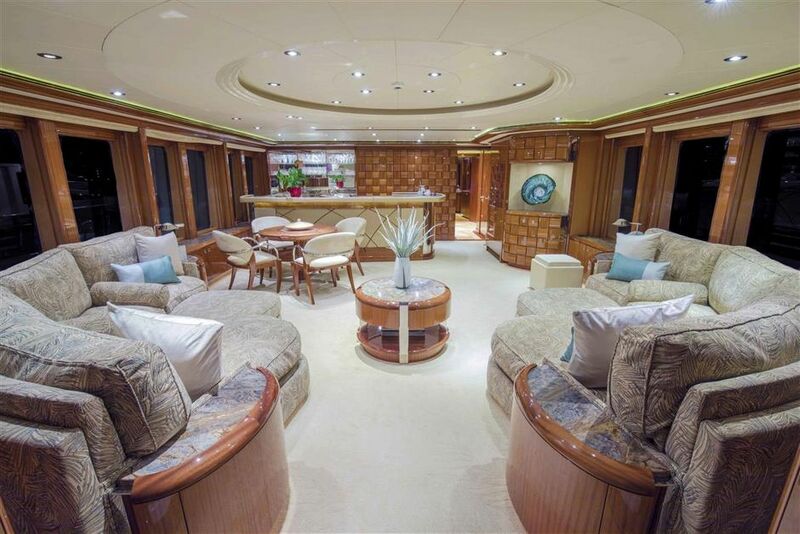 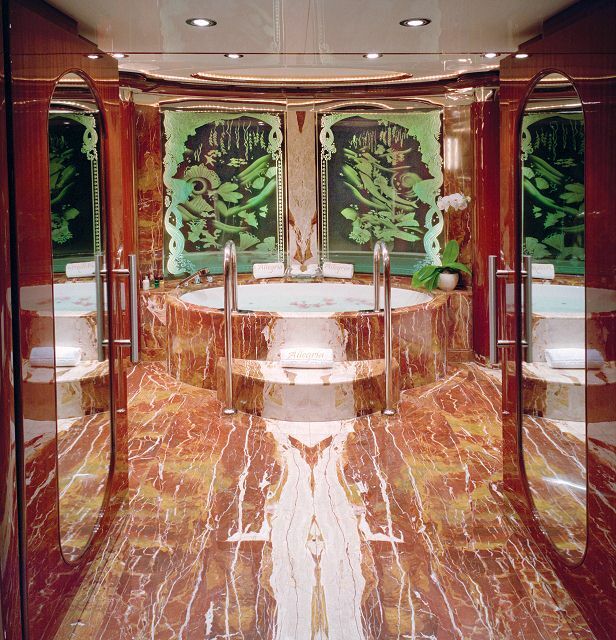 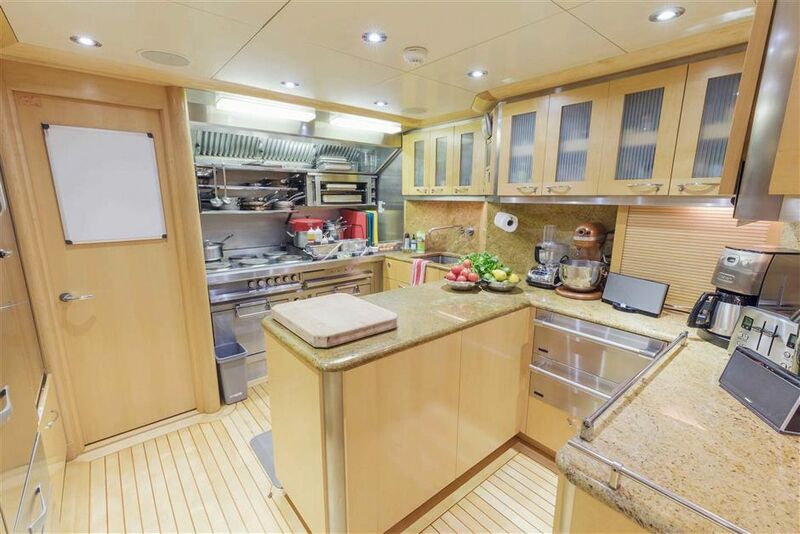 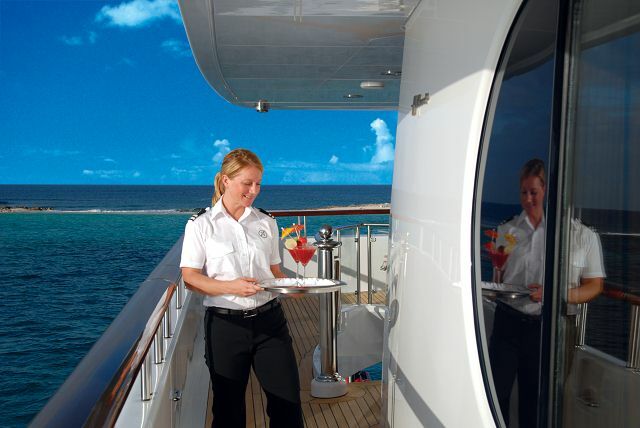 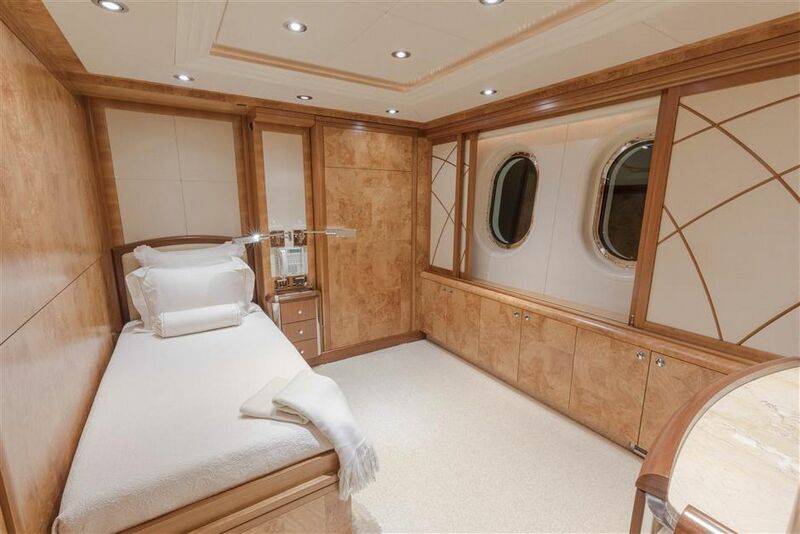 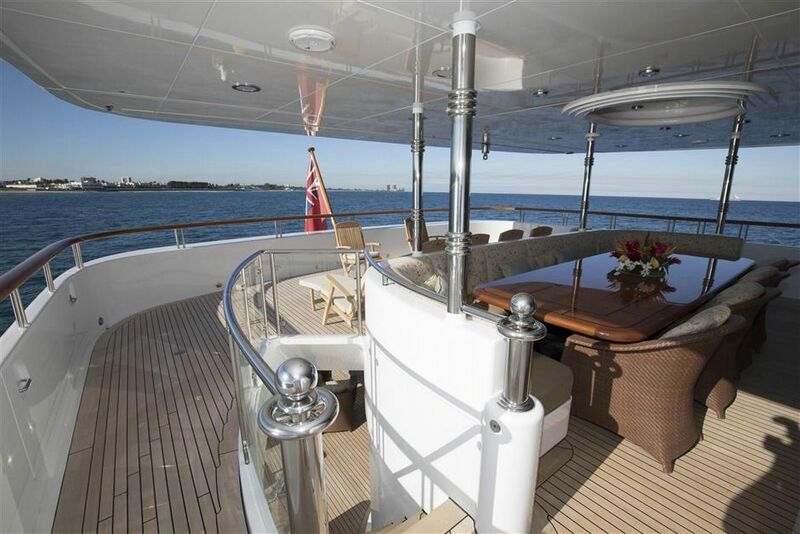 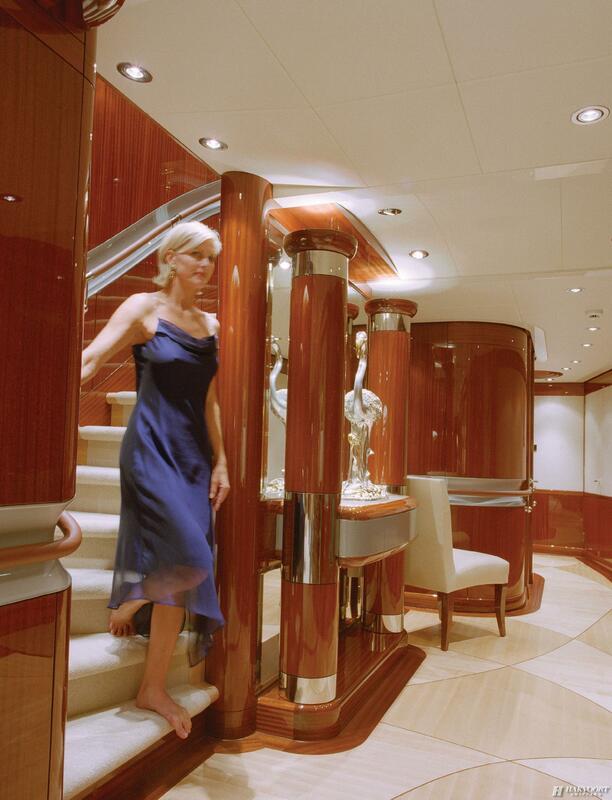 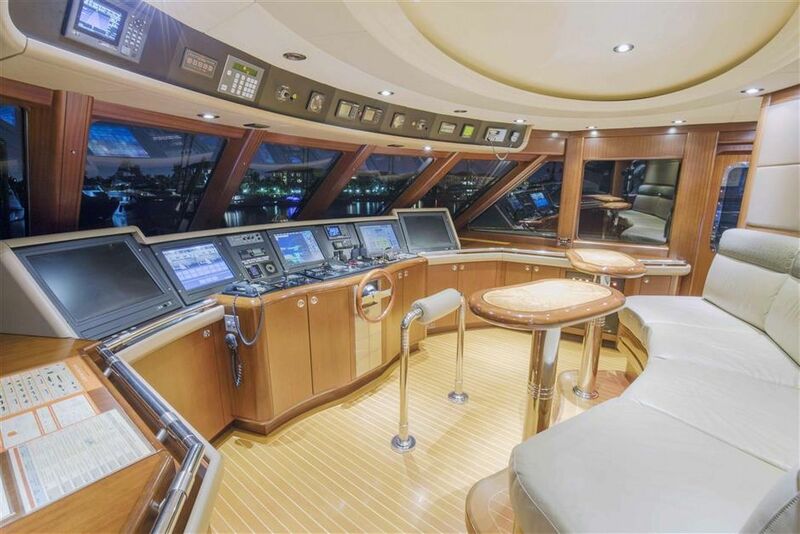 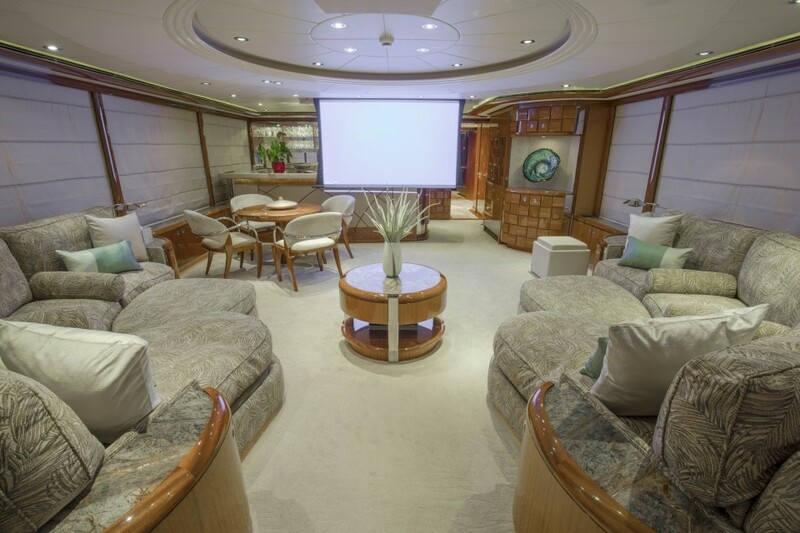 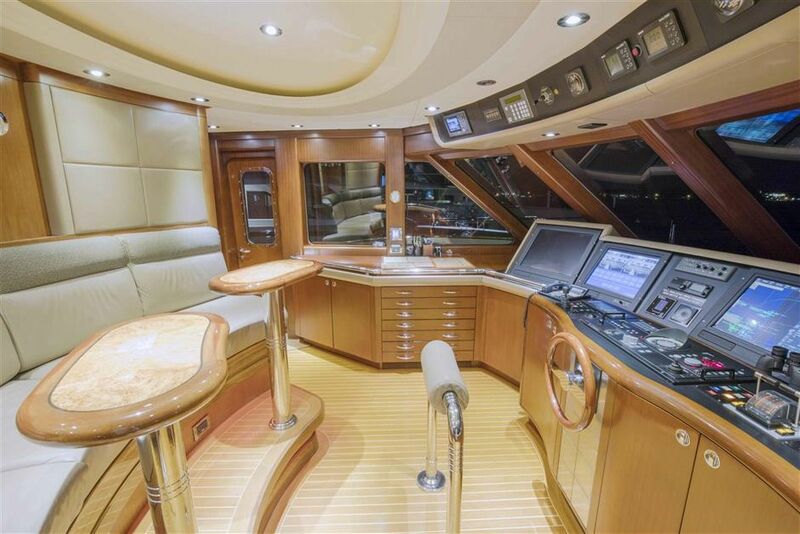 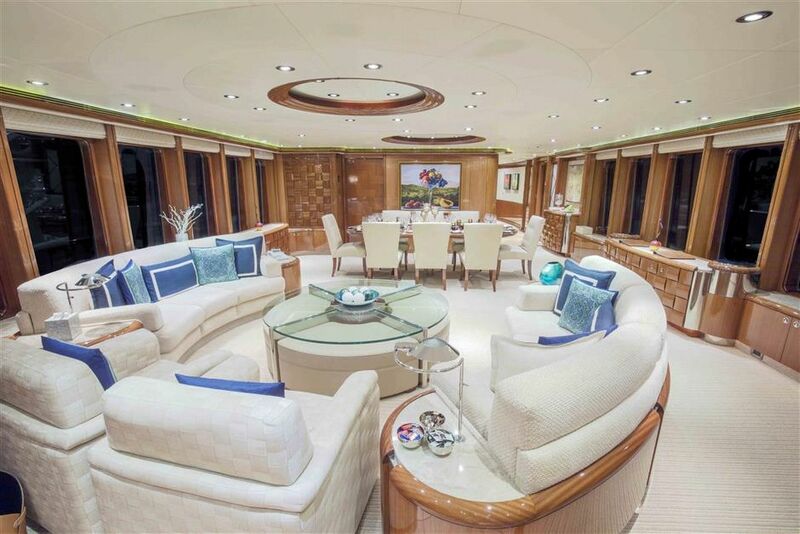 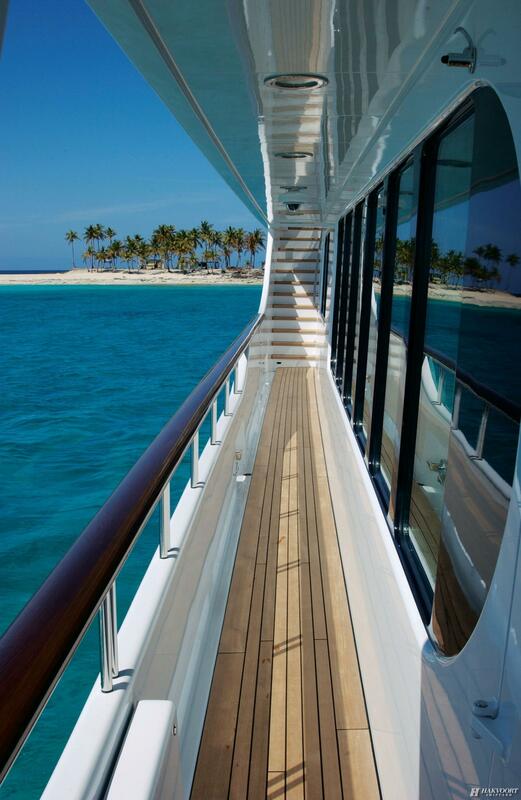 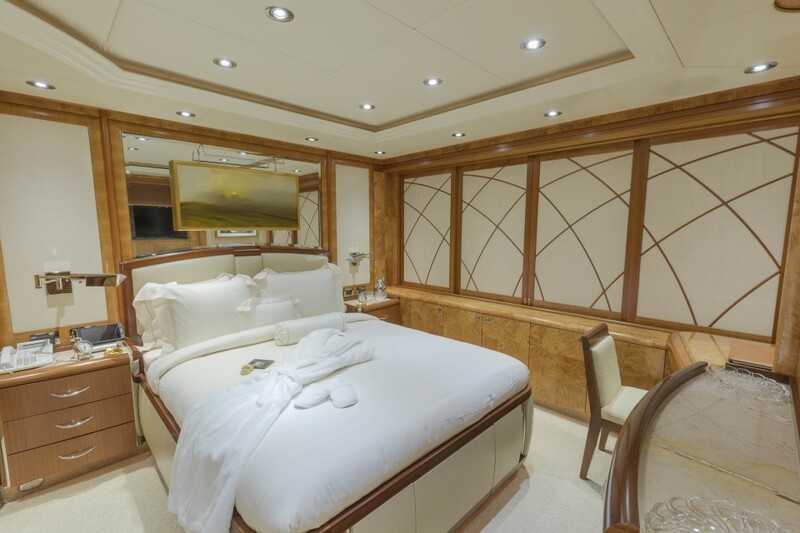 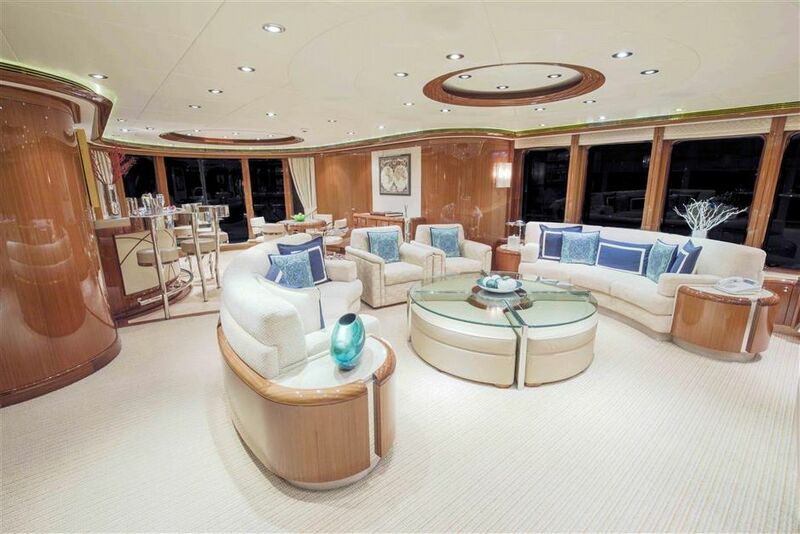 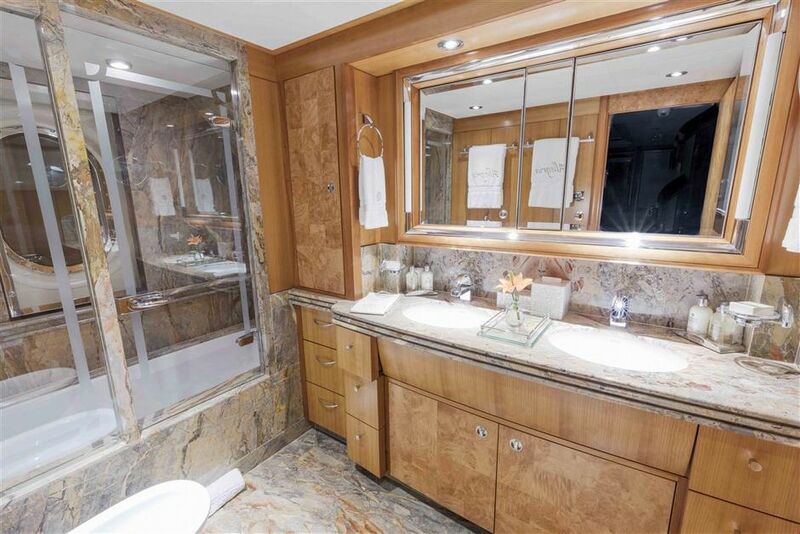 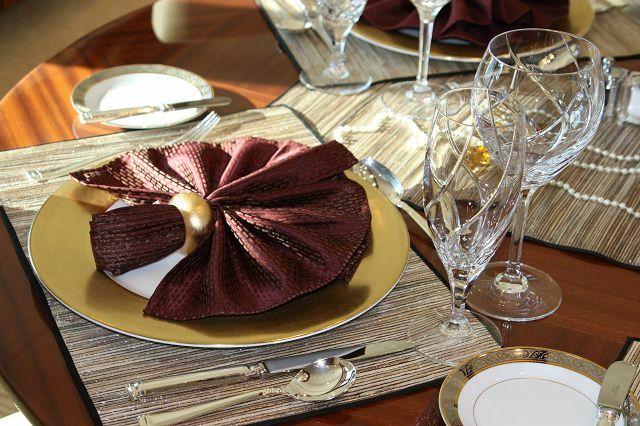 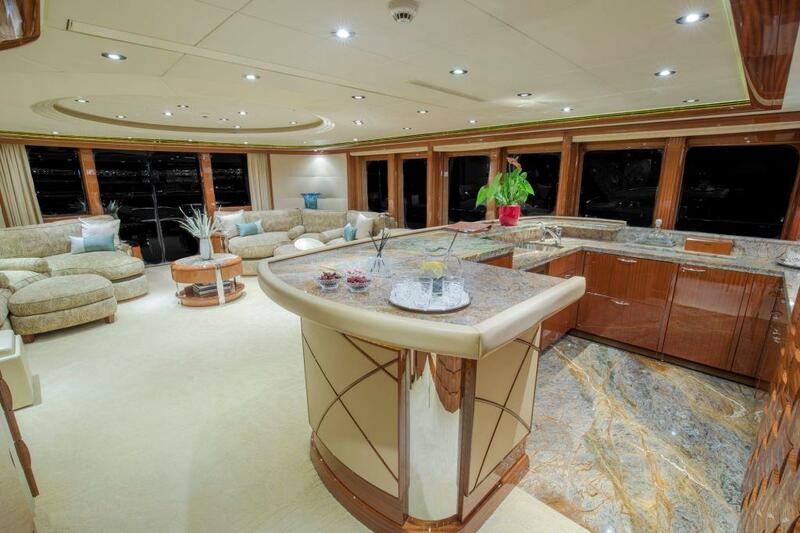 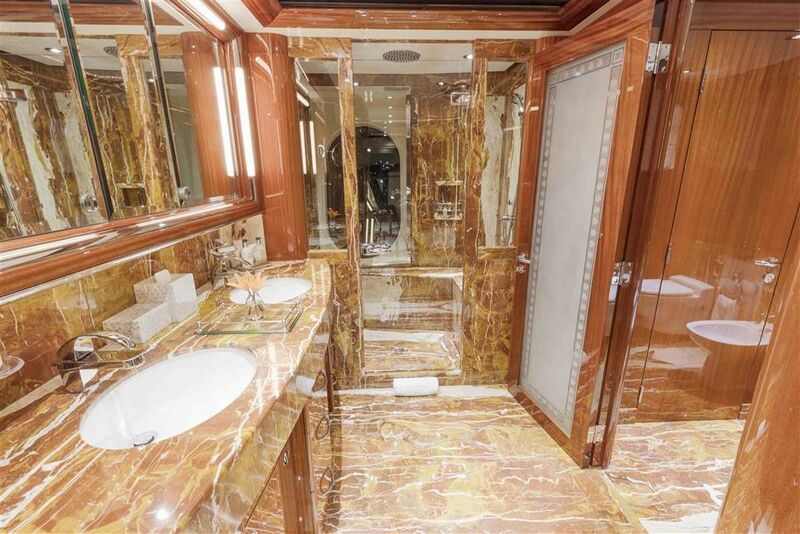 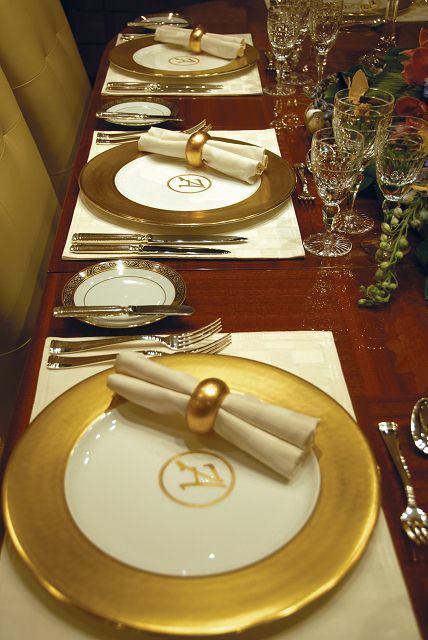 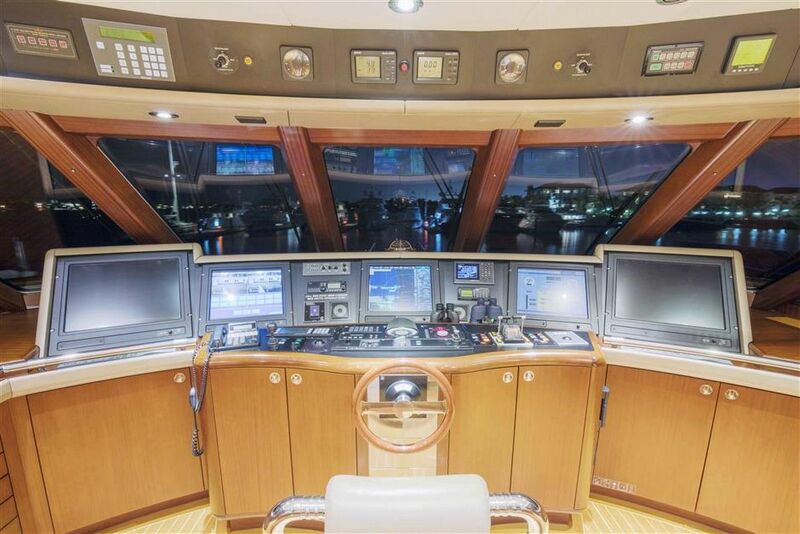 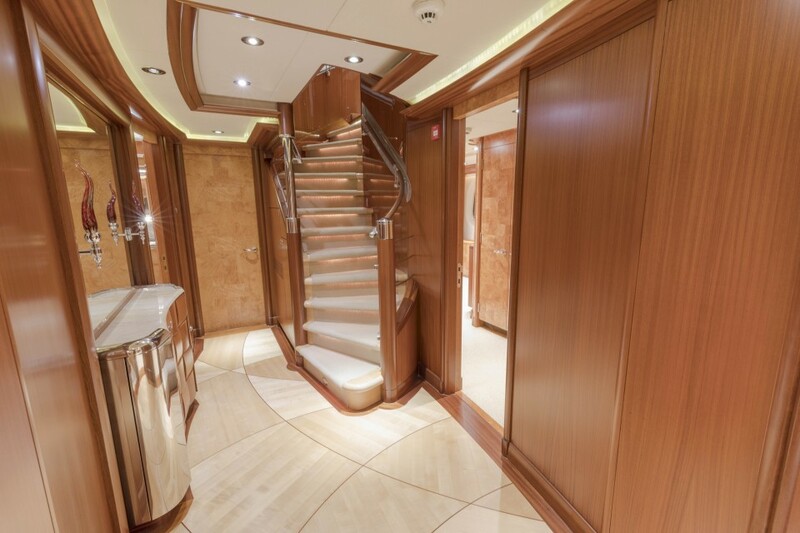 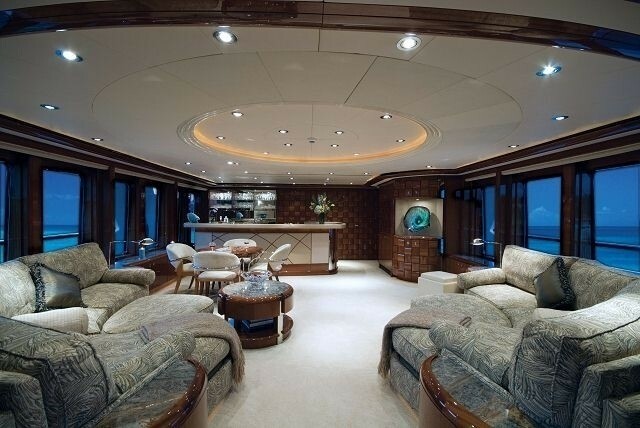 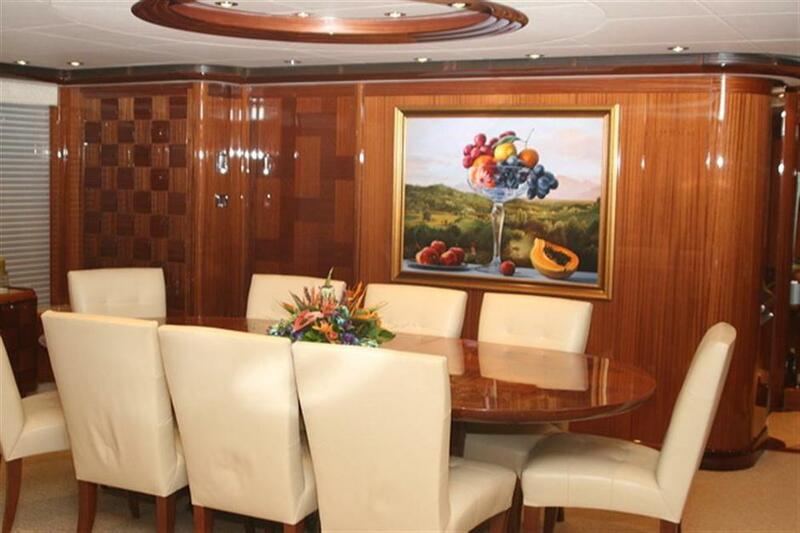 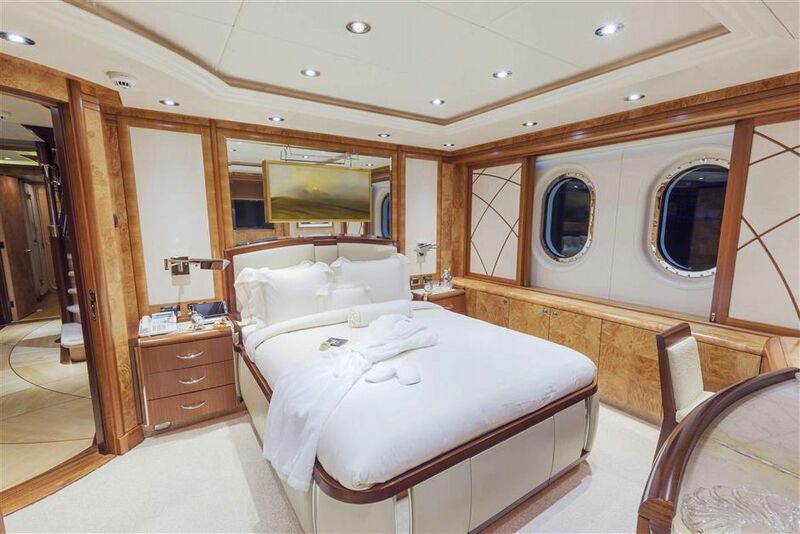 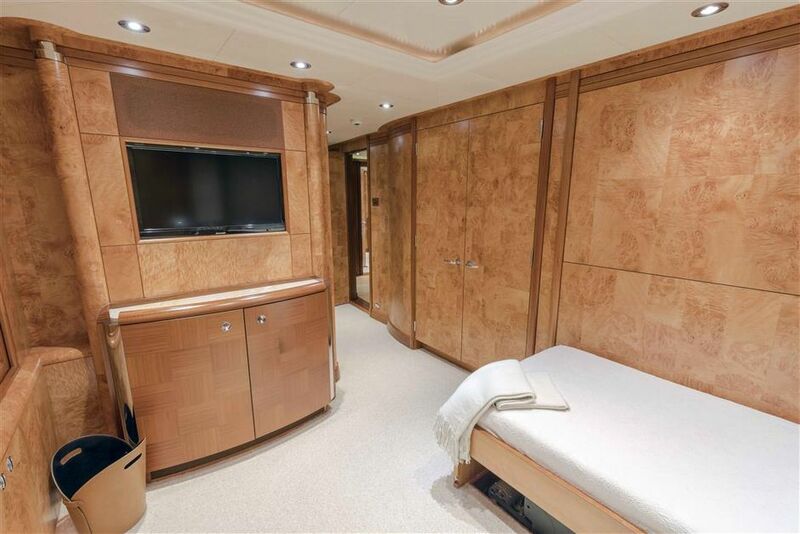 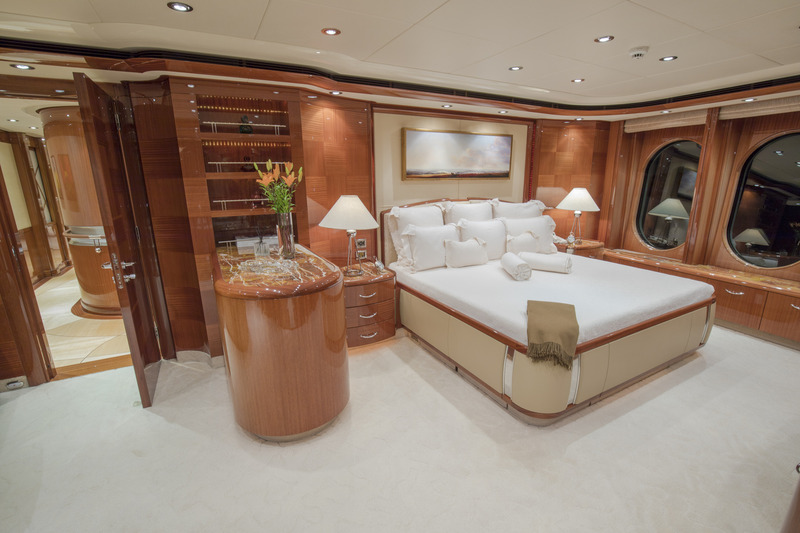 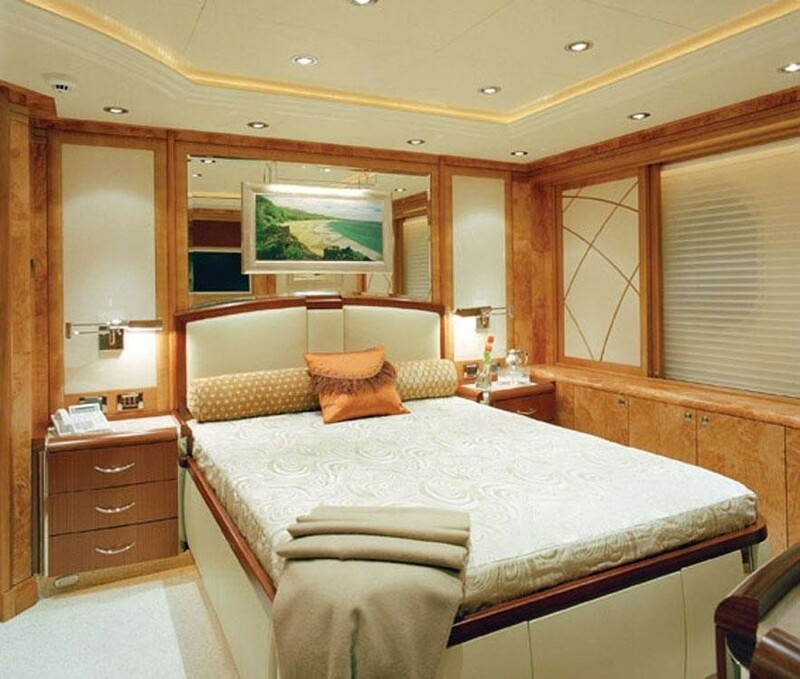 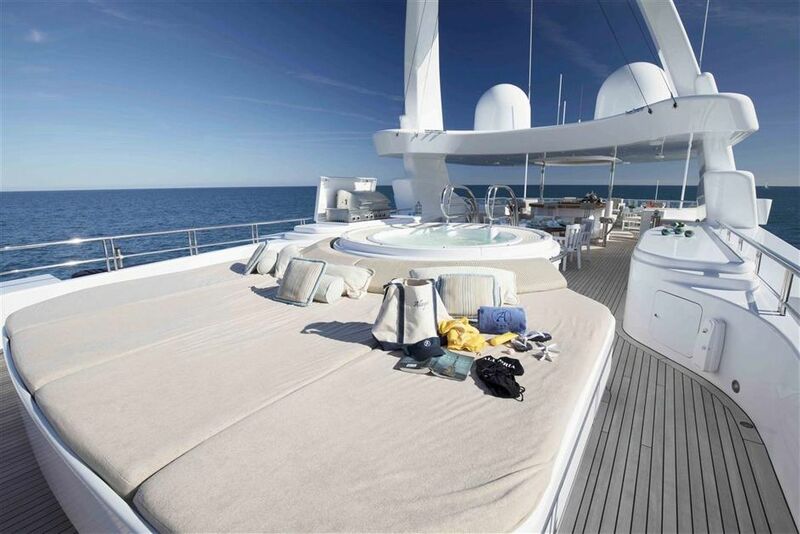 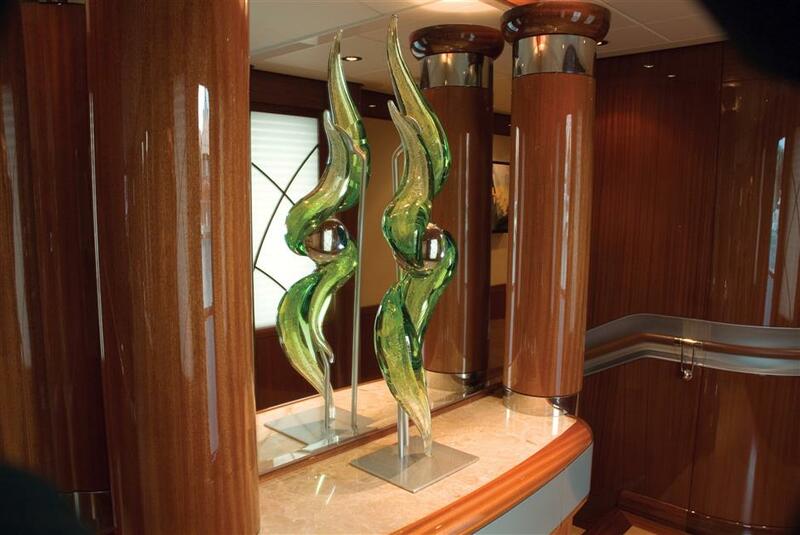 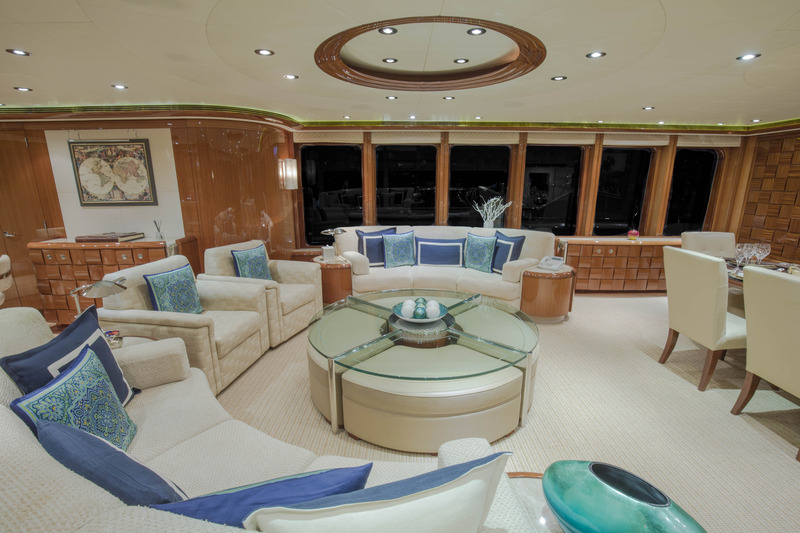 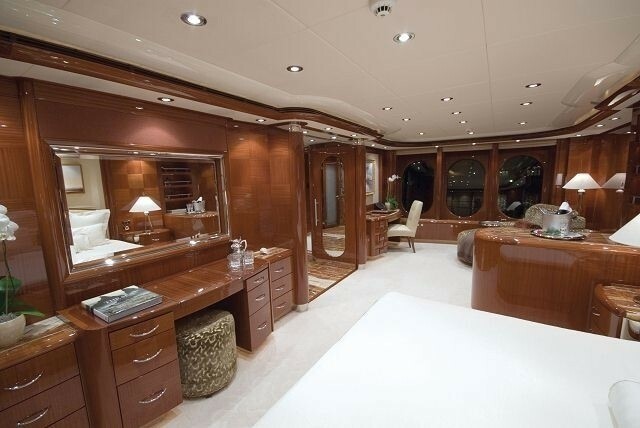 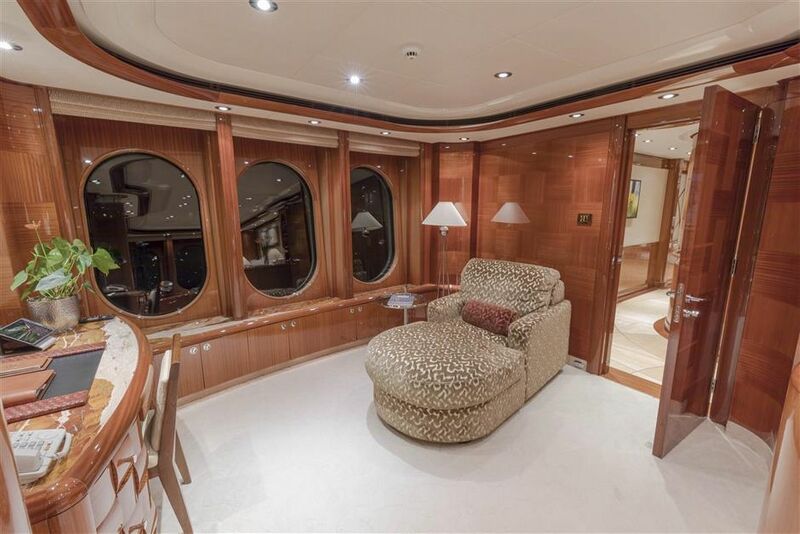 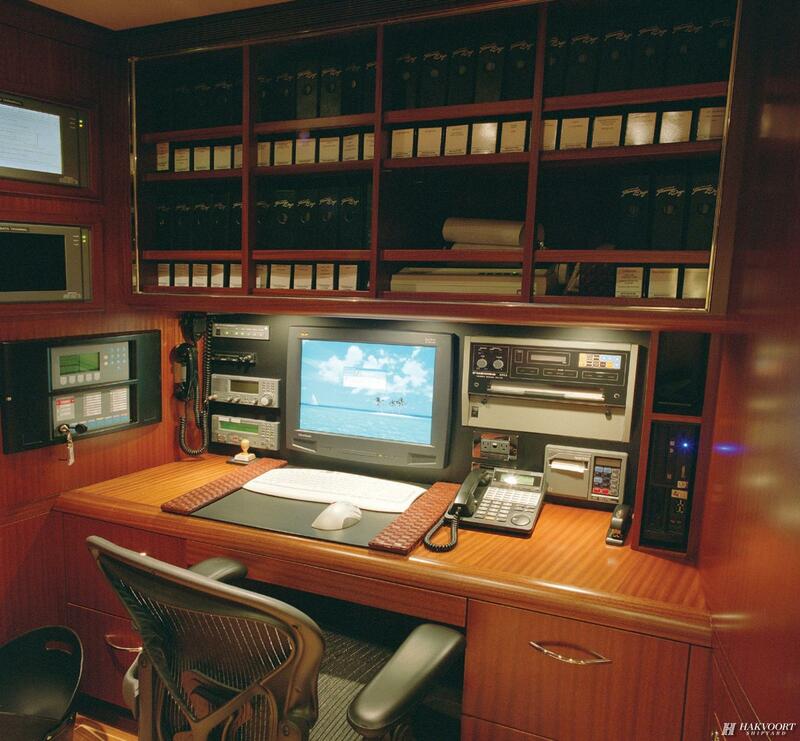 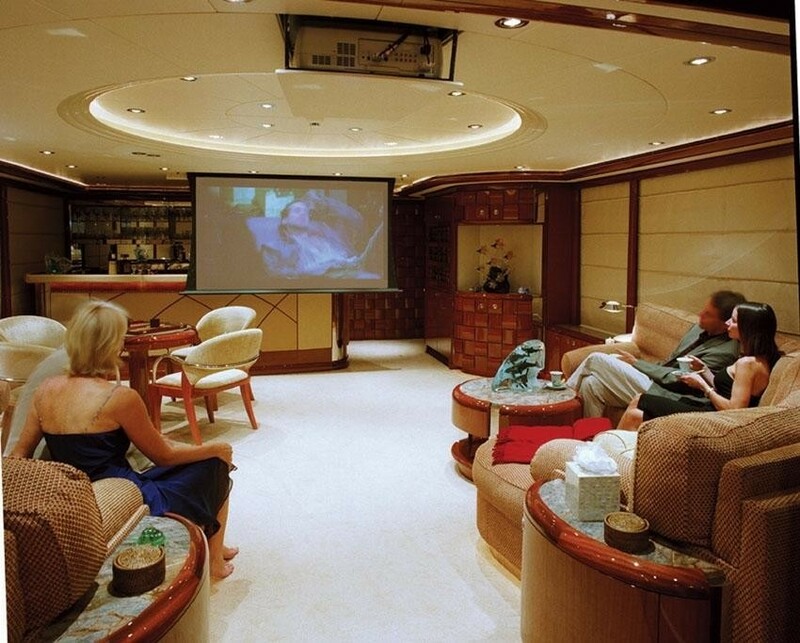 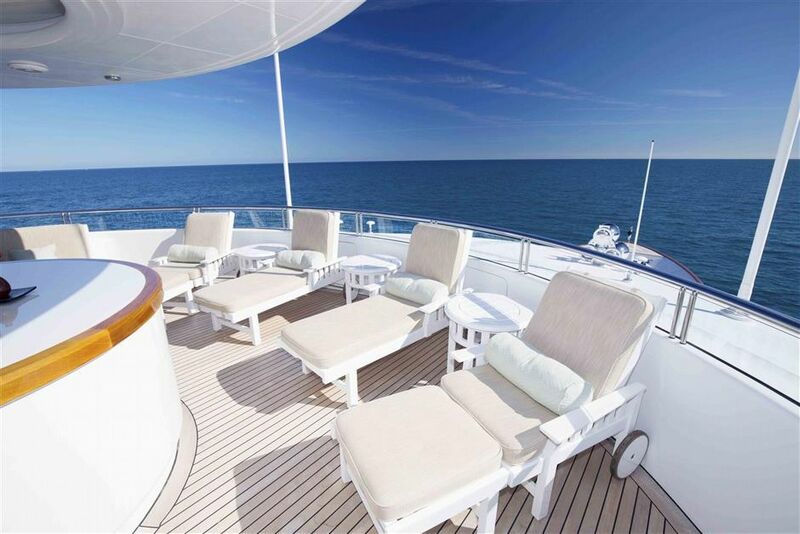 The master stateroom is on the main deck forward of the salon and is a full beam of the yacht. 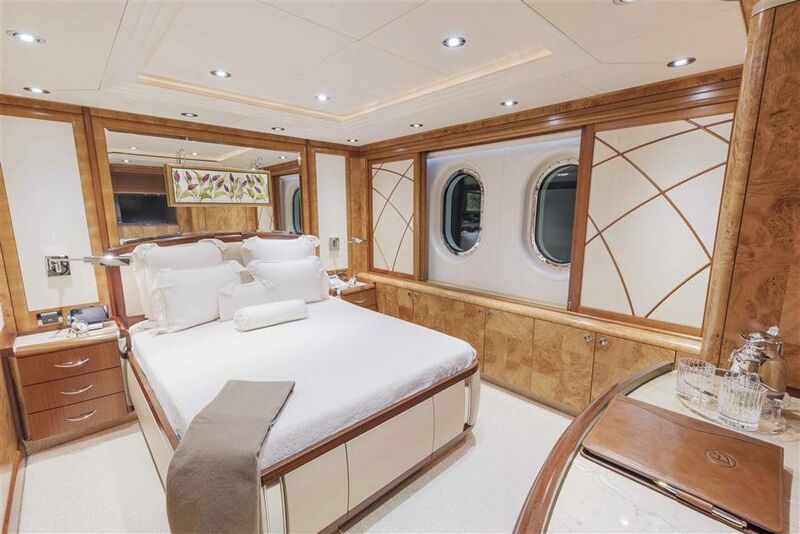 The master features a king size bed, study, walk-in wardrobe and full beam ensuite, with Jacuzzi tub, rain shower, and dual sinks. 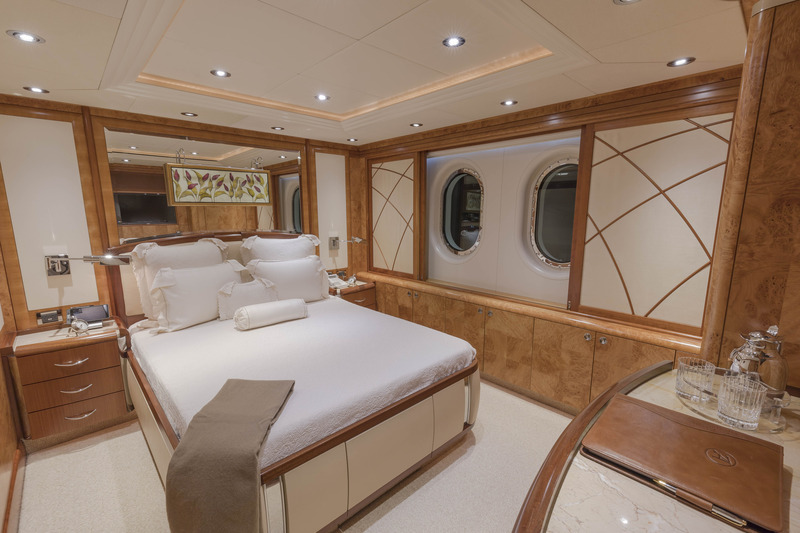 On the lower deck are 3 VIP cabins, with queen size beds. A twin cabin has side by side single beds and a Pullman berth. 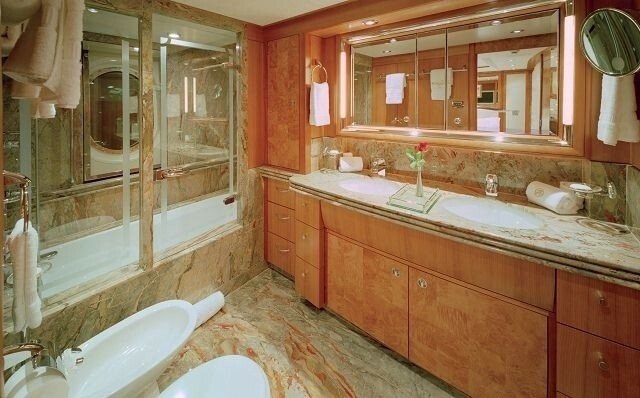 All the cabins are elegantly finished in cherry and maple burl woods, contemporary neutral furnishings and marble ensuites.